Summiting 19,340 ft., Mt. 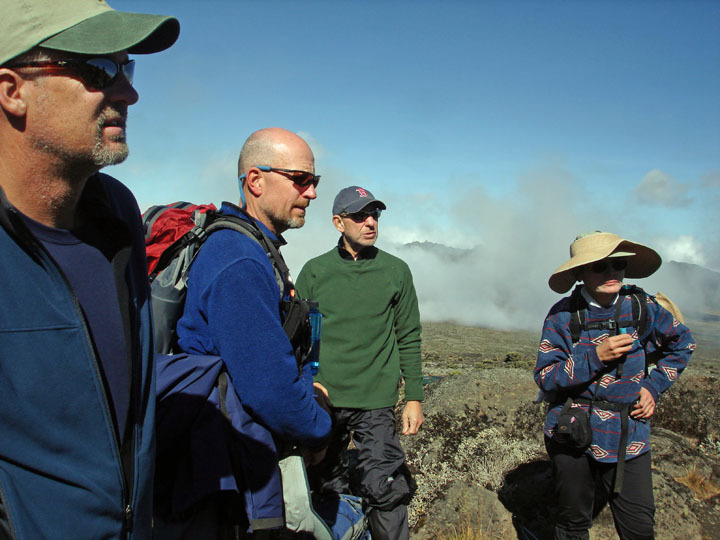 Kilimanjaro, Tanzania . . . . in front, Zeinab, Egyptian born and living in Salt Lake City and, left to right, in front, Edward, assistant guide, Kevin, from LA, Kaen Kapange, head guide with his 157th summit of Kilimanjaro, Rick, and Peter, from Denver. Tony, from Boston, was on his way and would also summit, making it five for five in our group. Another group of eight in our company had seven reach the top. We made the Trek with Thomson Safaris. Peter speculated the accomplishment wouldn't really hit us until later, some weeks down the road, when we'd returned to civilization. It was true that there wasn't a lot of time to loiter, not at this altitude. Get it done, get back down. At the top, a beaten down, fairly filthy Rick, face puffed a bit by early stages of altitude sickness, with the Snows of Kilimanjaro in the background. On this day, it was a struggle for me to finally get to the top, and, strangely, also a struggle to descend. It took us roughly 7.5 hours to go the six kilometers (four miles) and 4,000 feet of altitude gain, a distance I could normally run in about 30 minutes. At this height, however, there is 50% less oxygen than found at sea level and your pulse is racing to compensate. It's baby steps all the way and, as I would later find out, getting to the top is only the half way mark. Coughing fits were racking me and my energy level dipped to zero by the time we reached the top, both signs of oncoming altitude sickness, although my mind was clear, no vomiting, etc, the signs that things might be getting truly serious. Frankly, I should have taken a slower pace to accommodate what was turning into a fairly obvious, lesser ability to process oxygen versus my peers . . . . . but pride overcame brains and I kept pushing on the gas pedal until the top, probably egged on a bit by the fact I was keeping everyone within eyesight even as I periodically fell behind and caught up with a lot of obnoxious whooping and gasping. 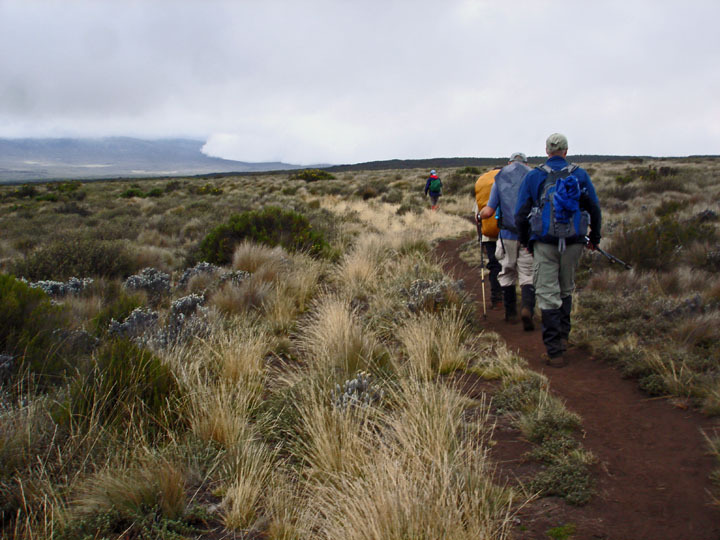 In Swahili, "pole, pole" is repeated over and over by our guides - "slowly, slowly." And this was a "double pole, pole day." Because we were moving at a minute pace, this trek didn't seem physically difficult for the legs, but it was way over the top as a workout for the heart and lungs . . . . . a strange disconnect. After about 20 minutes of coughing fits and obligatory celebrating at the summit, Kaen was eyeing me warily and said it was time to leave, that I had to go lower fast. I wasn't about to argue but then found my descent taking far longer than it should have, with frequent stops to bring my pulse down. Edward took the group ahead and it was just Kaen and I . . . . he was patient to a point, but continually forced us to keep moving, generally allowing only short respites. I fell once, jamming a finger and cutting up my hand a bit. I gave up on ego and handed Kaen my backpack, which he wrapped around his own. We went through 18,000 feet, then 17,000 feet and finally about 16,500 feet, where my energy level started to soar and I was able to pick up the pace. That's when I saw Aaron, our team medic, RUNNING up the hill towards us, a sight I found mortifying, embarrassed I had apparently caused that kind of stir . . . . . . but that was actually his second run of the day I would learn later. Obviously Kaen had radioed ahead of a potential emergency but I was fine by then. 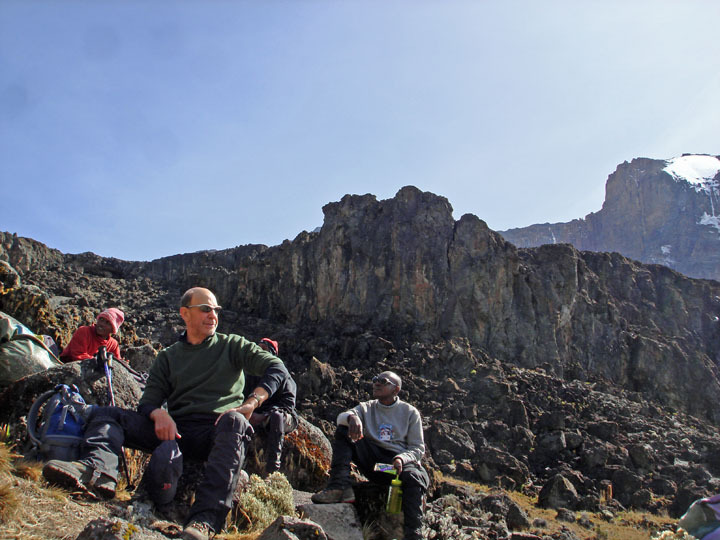 Fortunately, things with myself had improved to the point where we were outpacing our group and caught them again just as we entered Barafu camp at 15,300 feet. Chicken Noodle Soup at supper was the only thing I could wolf down but it was like a miracle cure, not only for myself but Peter as well. Zeinab and Kevin seemed the best in our group at handling the altitude, Peter was somewhere in the middle, while Tony wisely set the pace his body could handle and stuck with it, like the experienced ultra-marathoner he is. As with myself, Tony also called this the most difficult physical day of his life. In truth, everyone had a different experience on this day. 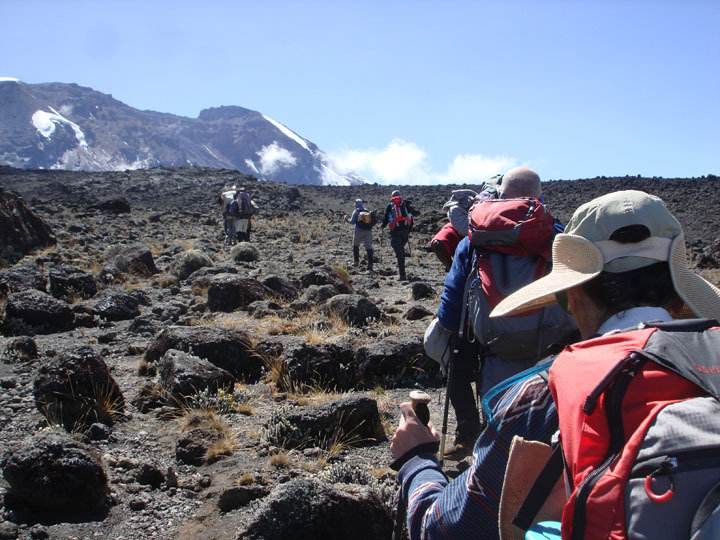 Every year on Kilimanjaro, there are about 1000 emergency evacuations, which is roughly three per day if we took the time to do the math . . . . . and depending on which statistics you believe, anywhere from 10 to 30 deaths. 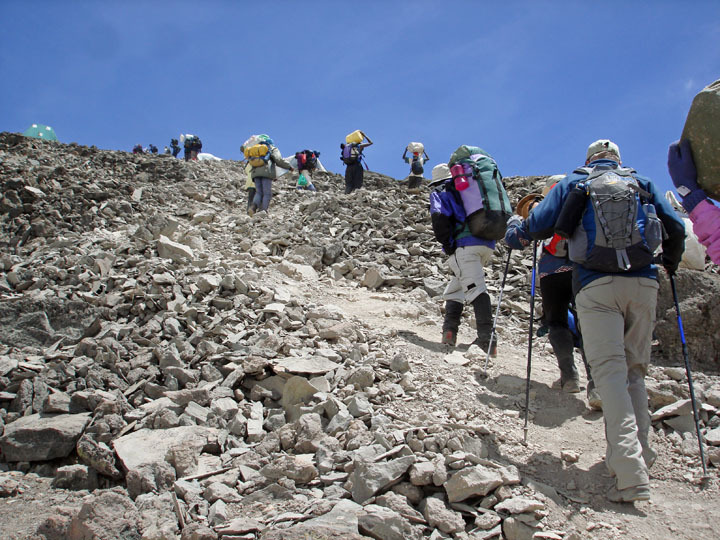 It's estimated anywhere from 25% to 50% of those attempting the summit actually succeed, again, depending on which statistics you want to believe. In hindsight, I'd say the underlying theme is that it's a grand adventure but one has to be pragmatic about it and have guides experienced enough to know when someone has to quit, and ensure the guides have the incentive to make the correct call . . . . because there is a good chance the trekkers, determined beyond reason, won't make that decision on their own . . . . . and that's the circumstances where the accounts of deaths we've all read about seem to come from. Kaen Kapagne, head guide, quick with a quip and a dodgy tale about his personal life, starting the trek with 16 girlfriends, working up to 32 and then down to zero by the time we were back in the forest. Kaen, who has a rooster crow for a cell phone ring, was featured in the New York Times article about the same Lemosho route trek at this link below, where there is also an interactive guide to the same route we took. Although a personable joker and full of song, including a wicked "Hakuna Mutata Kilimanjaro,"Kaen was all business when guiding me down from the summit and making an earlier decision to send one of our altitude sickness afflicted group of 13 off the mountain. If I remember correctly, aside from Tanzania, Kaen has been to Zambia, Kenya and Cape Verde. Kaen has a daughter named Jackline who is probably four years old right about now. He told the Times he climbs the mountain for Jackline, to send her to college some day. His would be one of the highest paying occupations in the country. A bemused Edward, the stoic, soft spoken, assistant guide, on the 700 foot vertical of the Baranco Wall. Later, Edward would patiently pace me along to the summit. 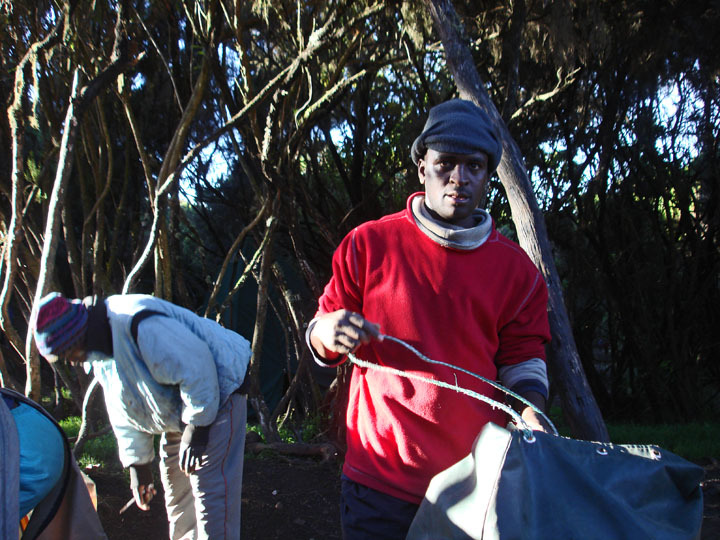 Edward is married with one child and his true love is carpentry but he describes life in Tanzania as "very hard." He is unexpectedly conversant in Spanish and French, as well as English and Swahili. Edward had an insatiable curiousity about wages/expenses in places like Canada and seemed astonished by both. 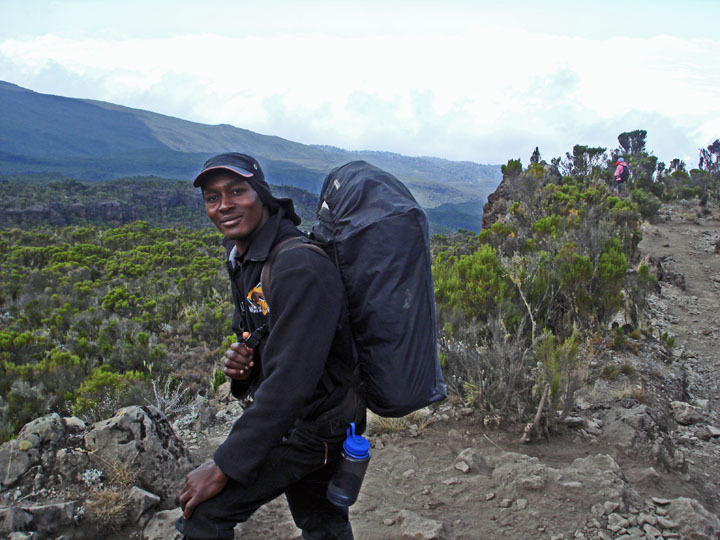 We would consider his monthly rent for an apartment in Tanzania incredibly low, but so are the wages earned by an Assistant Guide, although it would also be one of the higher paying jobs in Tanzania. It's all relative but there is no denying Tanzania is a poor, but beautiful, country. 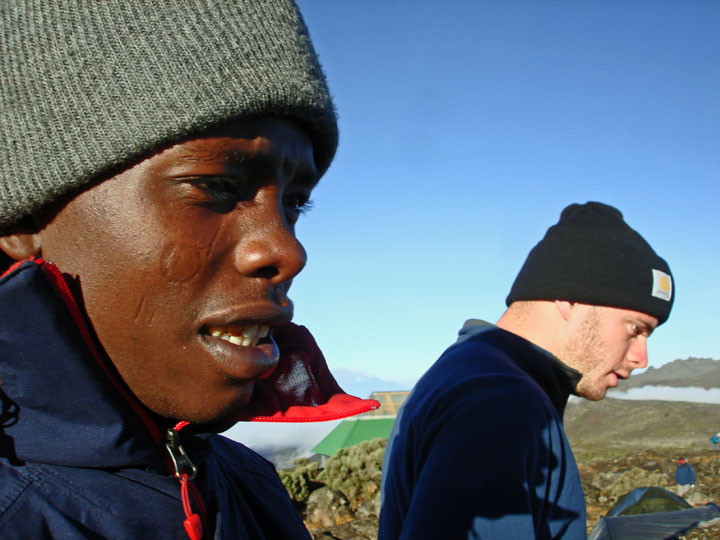 Edward, the videographer, with the mark of Maasai burned into his cheek, and Tom, a USA Army soldier, just back from 15 months in Iraq and already feeling the effects of altitude sickness. Edward probably put in more mileage than anyone, continually going ahead, dropping back, etc, looking for the best shots for his DVD. He's very proud to be Maasai. 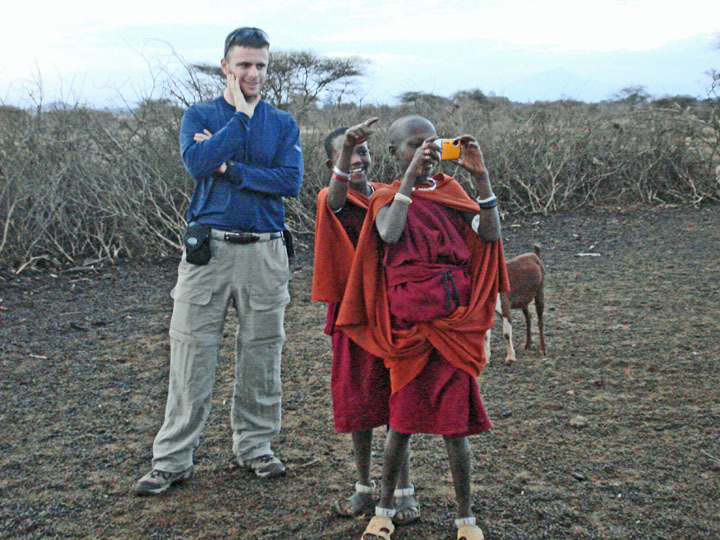 Edward is working with a company in Chicago in making a documentary about the Maasai. Two mornings after this picture, Tom would be forced downhill by pulmonary endema, the decision of the guides confirmed by two American physicians in our group. Tom told of spending a "depressing night" pondering his fate but had accepted it by morning. 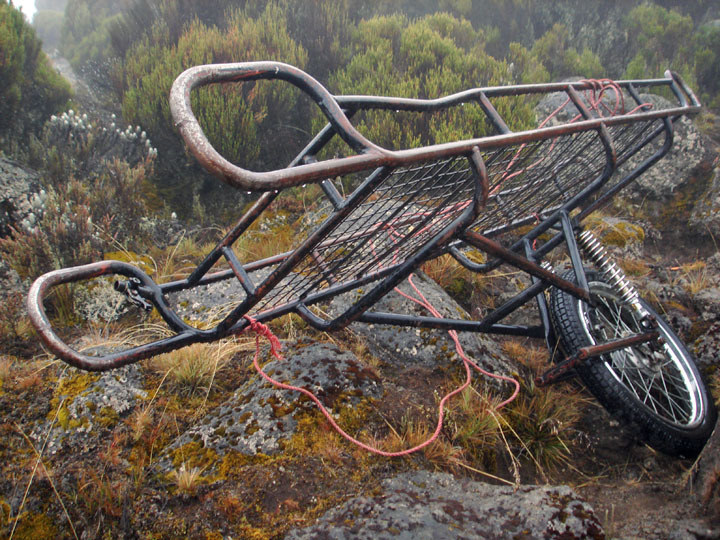 There are many stories of less scrupulous guides/tour operators who would have let him continue, perhaps to his death. Better to face reality and descend with a more than acceptable reason for turning back. In the end, it's just the luck of the draw as the illness can afflict anyone, including the youngest and fittest like himself. 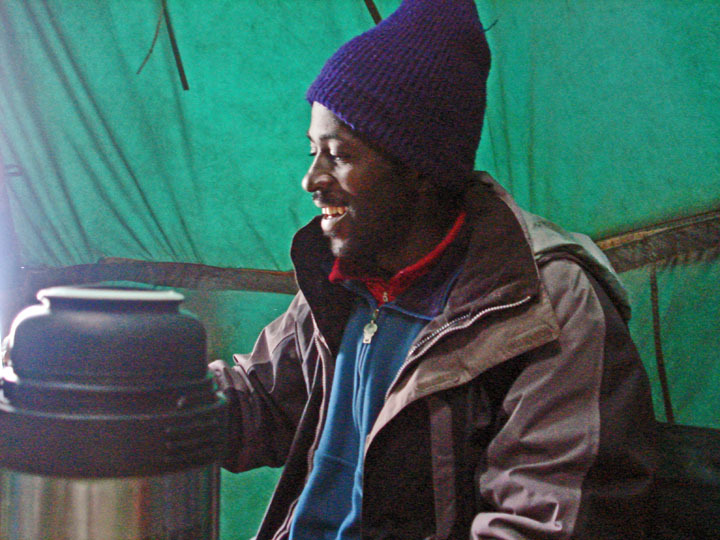 William, assistant guide and former Rastafarian, his locks now shorn, descending into the Baranco Valley, Mt. 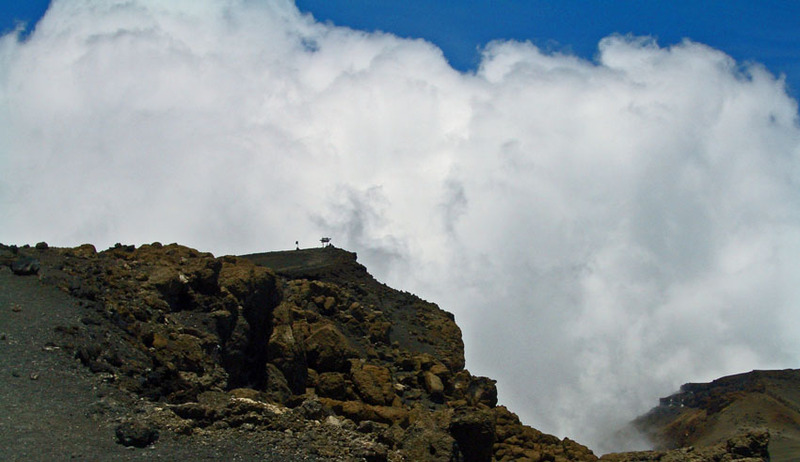 Meru hovering above the clouds in the background. William's favourite movie is "Jumanji." It was William who would pace Tony to the summit. William and Kaen have worked together for many years. Aaron, with a beautiful singing voice, the team medic who would miraculously run up the mountain at 16,000 feet to meet my troubled descent, apparently his second such run of the day. Here he is a few days earlier on the Shira plateau. Zeinab described him as a "philosopher," self-educated, well-read and somewhat worldly. Aaron wants to be a doctor and is saving money for the $1,000 he needs for his first year of medical school. Or $3,000 for a really good school. I had noted this hatless image of him before summit day but advanced my planned gift of a new but never used safari hat after his run up the hill. The bag on his back contains medical equipment, including, I think, an oxygen bag in case of an emergency situation. Fortunately, we never had occasion to actually view the contents. We were each assigned a personal porter, but I'm not sure if I ever got the right pronunciation or spelling for my own, which was my fault. I believe his name was Auede, although the pronunciation sounded more like Elrude, and I hope I've gotten that right. He was responsible for packing my 31 pounds of extra gear around. One of our porters was a pastor. 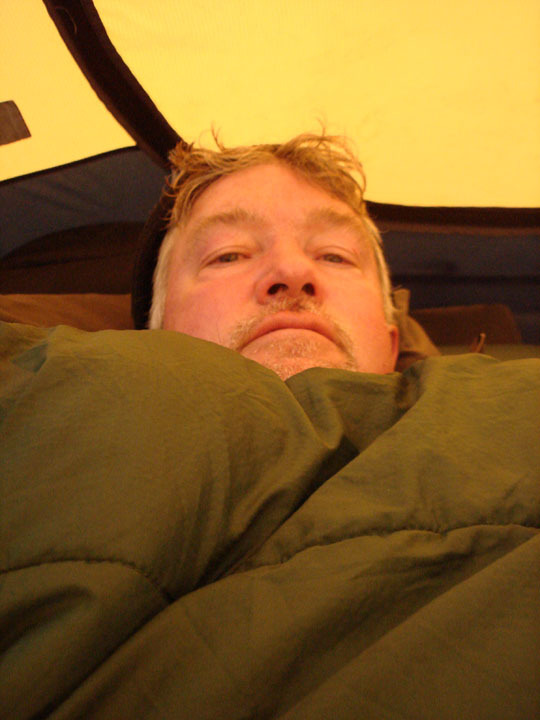 My least favourite job of the day came early, folding up the air mattress, stuffing the sleeping bag and fleece . . . . at altitude, it seemed to take a lot of energy. 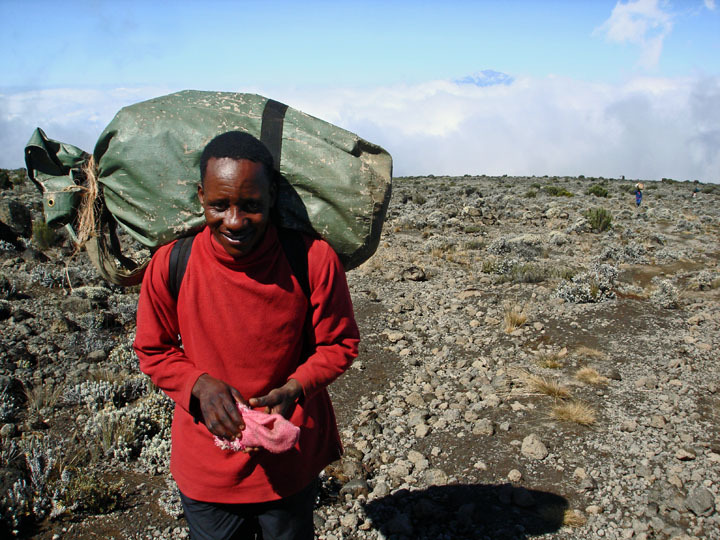 But then I tried to remember one of these porters was carrying our chemical toilet on his head up the hill all day. That would be infinitely worse. 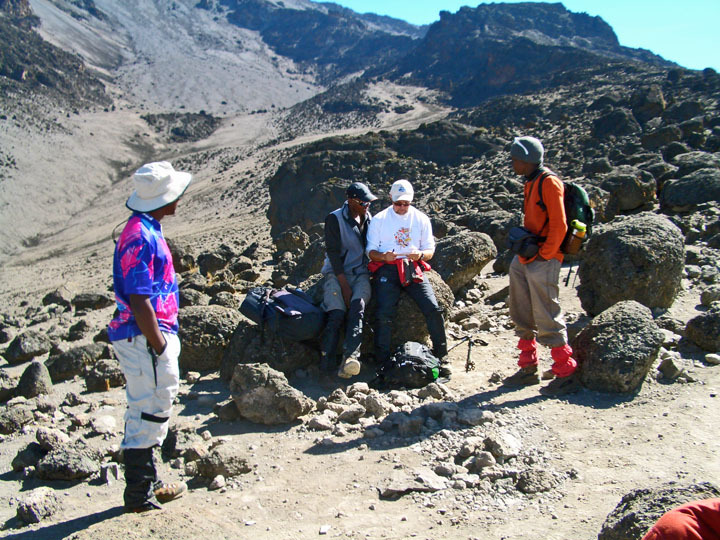 Fellow trekkers . . . . Kevin, Peter, Tony and Zeinab. Great group to be with. Another eight, bringing us to a total of 13, were in a second Thomson group, although we got to know them well as we moved along the same route and camped in the same places, and we generally thought of ourselves as all together. 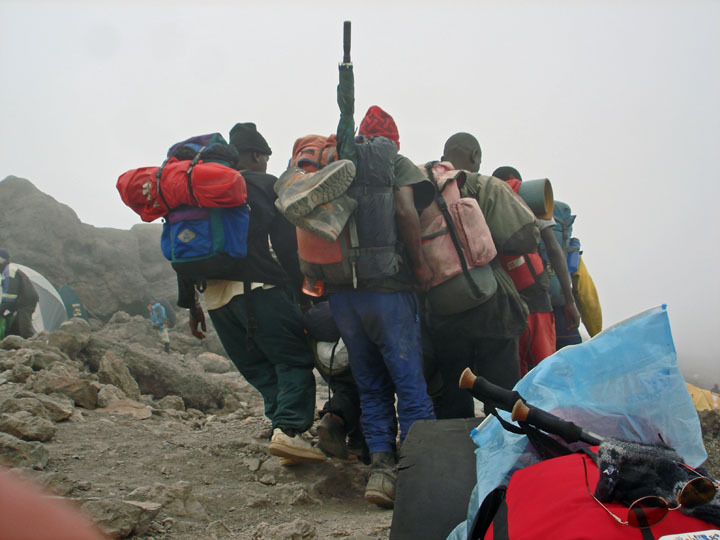 The common porter, 32 of them supporting our five tourists and three guides, on summit day, with 16,889 ft. Mt. 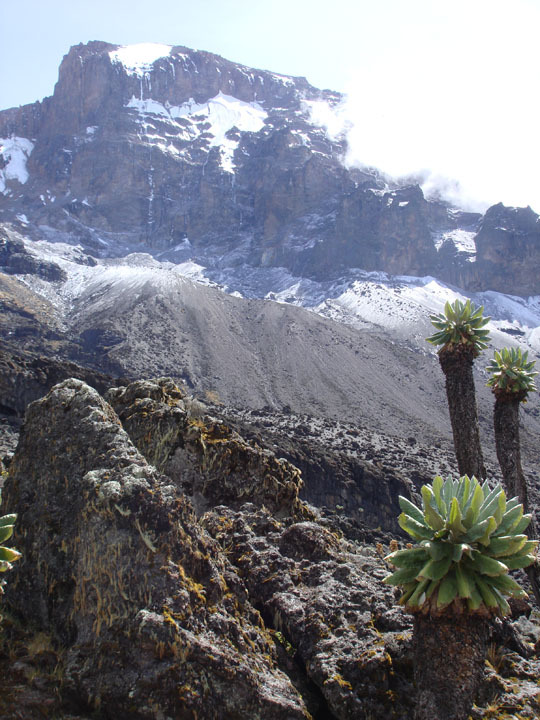 Mawenzi below them in the background. They're above the clouds, at roughly 17,500 feet for this picture. 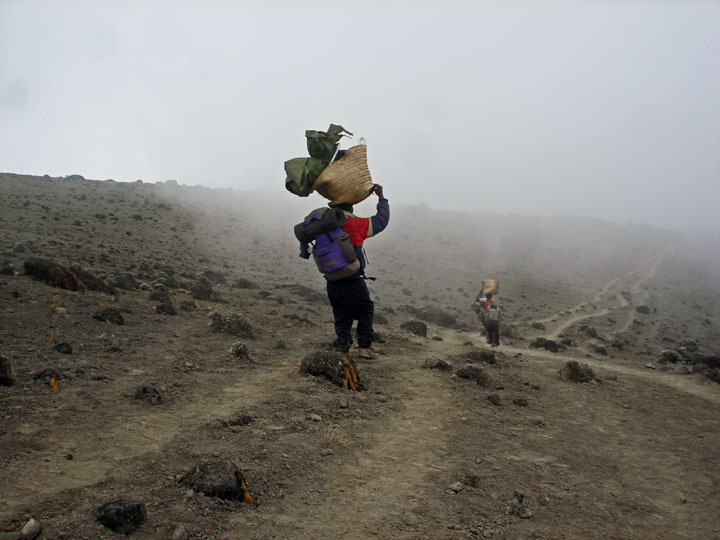 Porters earn an average $7 to $8 a day, with this trekking company, less with others, and were mesmerizing in their ability to carry heavy loads far faster than we could walk with our day packs. There was no end to the admiration we had for these guys, as athletes if nothing else. But at this altitude, even they were going glacially slow. 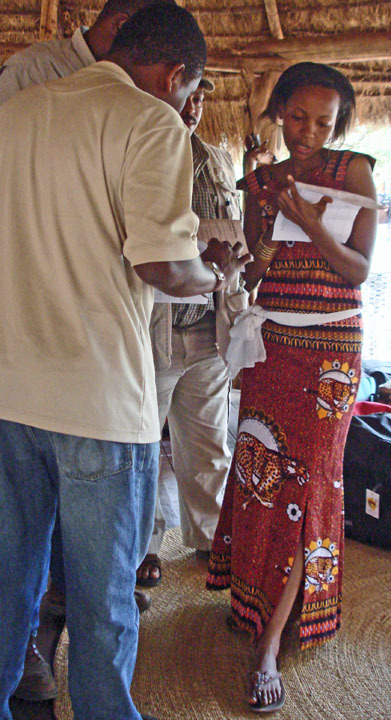 Porters sign in at Londorossi Gate . 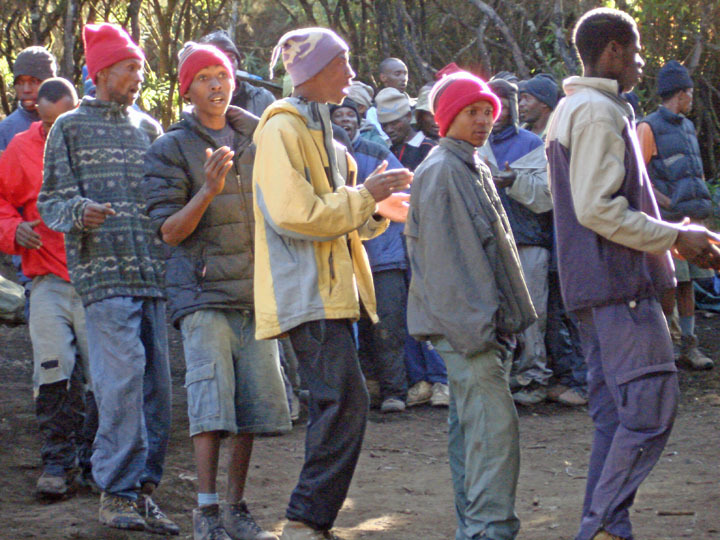 . . . . We signed into the park here, then transferred down the mountain a bit to Lemosho Gate. 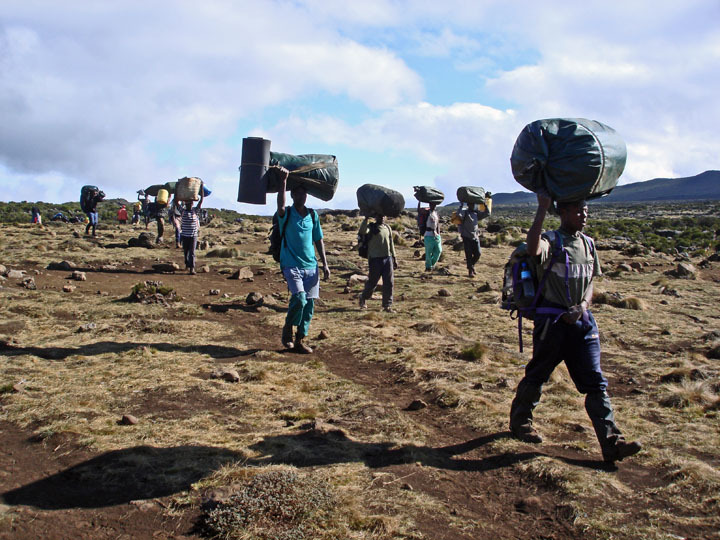 Porter deaths through the years, from neglect by tour operators, have forced standards to be raised so they have proper boots, warm clothing, etc. A few days into the trek, Park Rangers, who were the subject of a porter union strike in 2005 over charges of corruption, would notice one of our group with too much poundage being carried by a personal porter, something of a surprise to everyone, perhaps even to the trekker as well, since Thomson representatives had diligently weighed our gear before we even got to the mountain. Thomson's reputation is such that their trekkers often aren't checked at the Gates, making the signing in process easier at the start point. The guilty party was fortunate to be able to hire a second porter at Shira 1 to split up the baggage, otherwise it might have had to be dumped. Still, in our case, it was a good sign that Rangers were endevouring to protect the porters and, as far as I could see, our porters seemed to be well-equipped and happy to be there. But abuses and even deaths still occur. These are sought after jobs, among the more lucrative in the country. 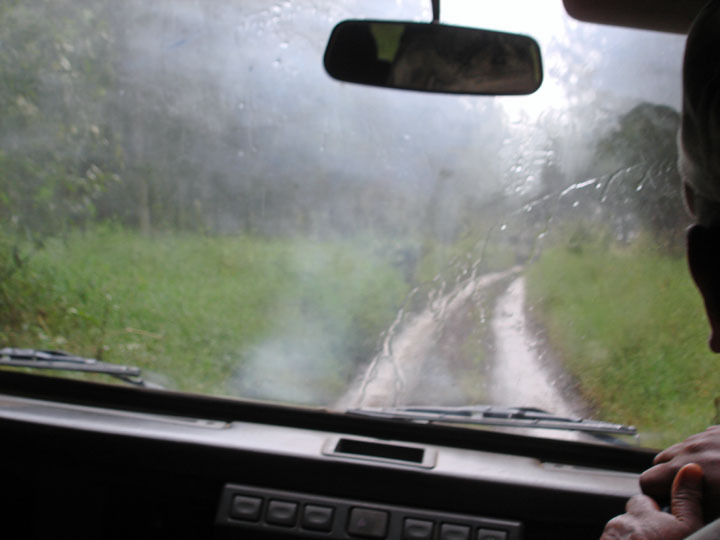 A wild ,4 wheel low drive up to Lemosho Gate over a heavily rutted, gumbo-like road . . . . . we came close to sliding over a precipice within a hundred feet of our goal . . . . . but we ascribed that to being just part of the adventure. Nobody lost an eye, so it was all fun!!! 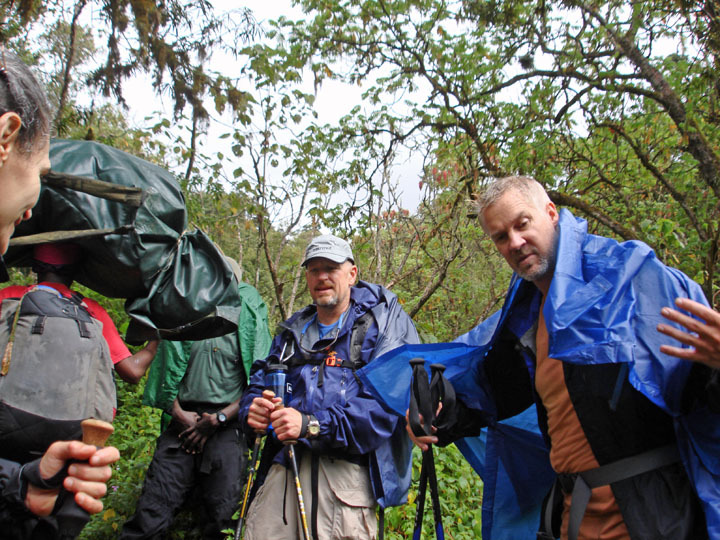 Walking to Forest Camp required all of our rain gear at the start, Zeinab, Peter and Kevin starting to shed theirs as the rain begins to ease up. The first 200 yards of this trek were in a downpour and pretty much straight up in slippery gumbo, causing us all to wonder what we'd gotten ourselves into. Later, one member of our 13 group party (divided into teams of five and eight) cracked a rib in a fall while there were numerous other tumbles, including one of my own that I would describe as being akin to falling on a double black diamond on a ski hill. Hard to get up without sliding further through the mud. 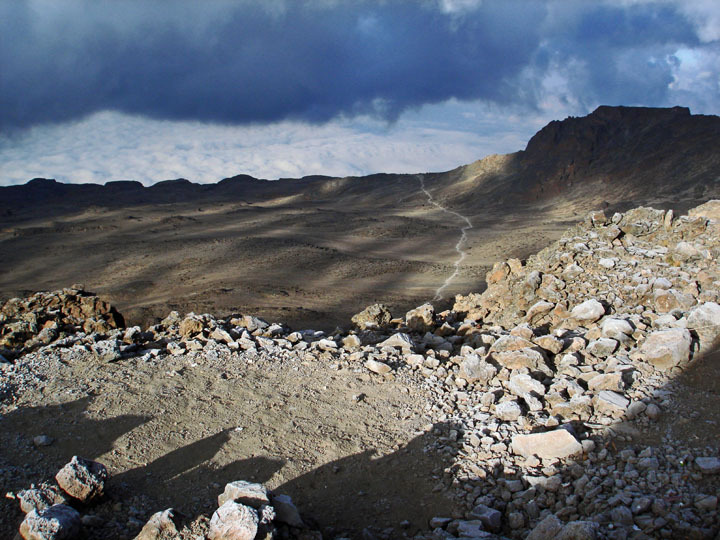 Through this mountainous trail we were surprised to come across beaten down elephant trails as well as jackel poop, going from 7,800 feet to camp at 9,300 feet. Later that night, it was fire ants that you had to worry about, crawling up into your pants or into your tent. Strangely, I seemed to be the only one who actually enjoyed this day. Up and down hills in rain forest and mist . . . . .
. . . . . gives way to the Shira plateau . 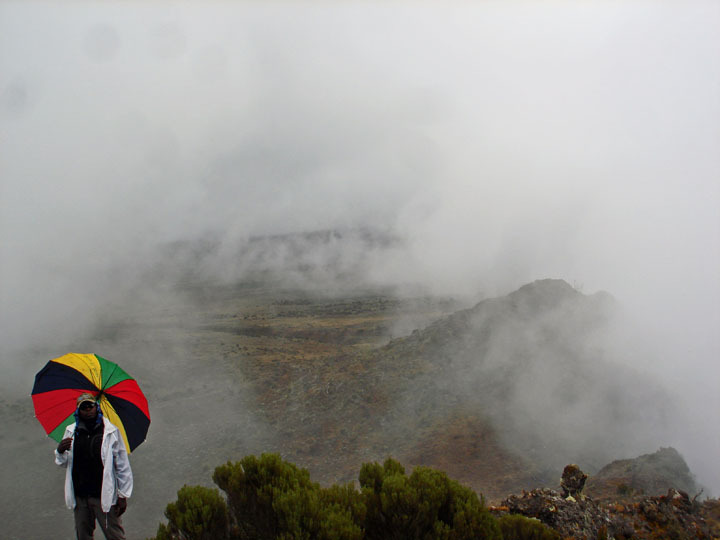 . . . . and mist blanketing Kilimanjaro ahead. Flat as it may look, this is at roughly 11,200 feet and I felt the first effects of altitude. As we moved out of the hills and into a descent, I felt strong and welcomed William picking up the pace only marginally, but it was enough to give me some shortness of breath, a higher pulse and a headache by the time this picture was taken. It also made me wonder how I'd feel once things started to get serious. Fortunately, by midnight, some Tylenol had fixed me up. Advil seemed to work for others. 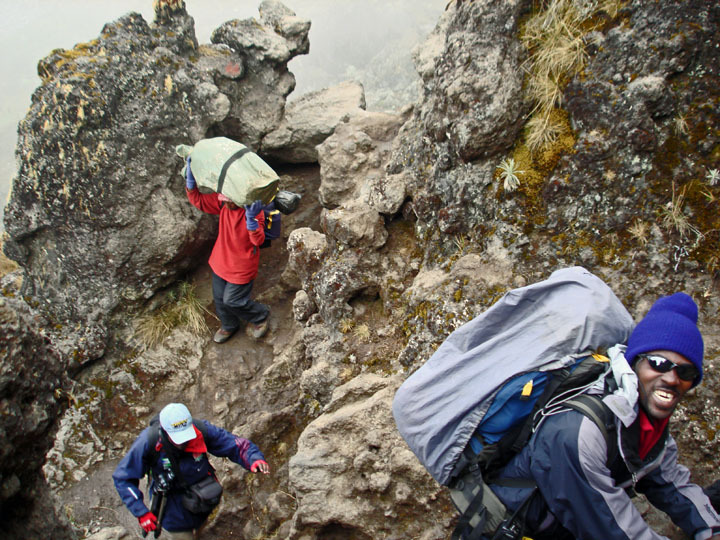 Most, including myself, brought various medicines, including Diamox, for high altitude relief. With Diamox, there seemed to be various instructions from doctors on how to use it. Some had been told to use it only in emergencies, others to start using it before they'd even reached higher altitudes and others to use it "as needed." Aside from a brief, but intimidating, moment the night before, sunrise at Shira 1 camp, at 11,200 feet on the Shira plateau, was our first real good look at our objective, still days away. We would be marching round the right corner of the mountain, then straight up. 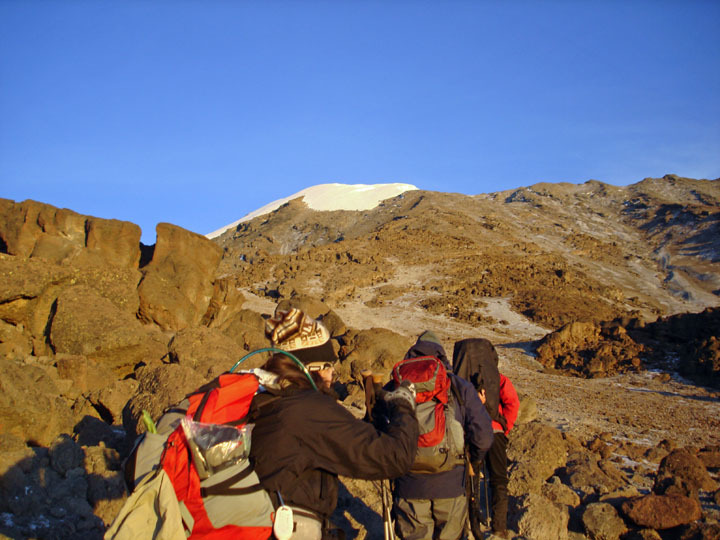 Kilimanjaro is actually three volcano summits, Shira, Mawenzi and then Kibo, the latter the highest and youngest. Earlier in the night, I'd been outside at about 4 a.m. taking a whiz, and ended up nearly falling over numerous times as I tried to multi-task, taking care of business while also gawking straight up in amazement at the absolutely crystal clear, light-pollution-free, high altitude sky overhead. A rare sight in our crowded world. 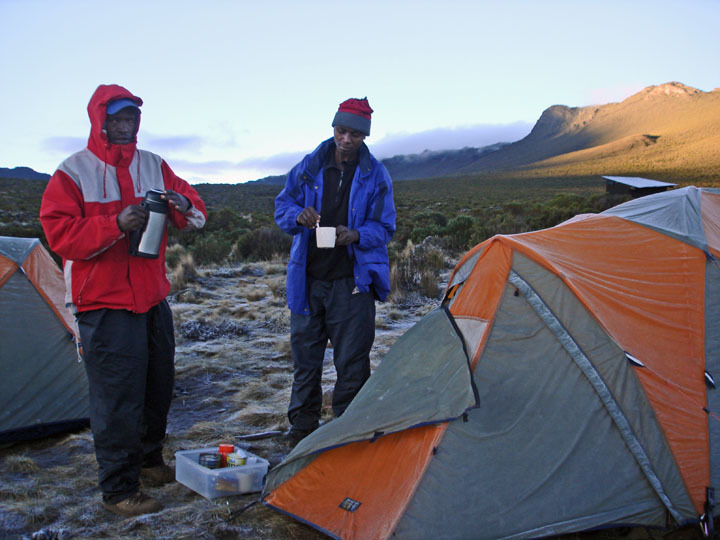 The start of the daily routine, a wakeup call with coffee/tea brought to your tent at 6:30 a.m., seen here with our two cooks. I was never sick in Africa from water or food although I probably did drink too much ginger water (a ginger root boiled in water) that I think gave me some pretty severe heartburn later on. The camp followed us wherever we went . . . . . . packing up and heading out from Shira 1 camp, on the Shira plateau. 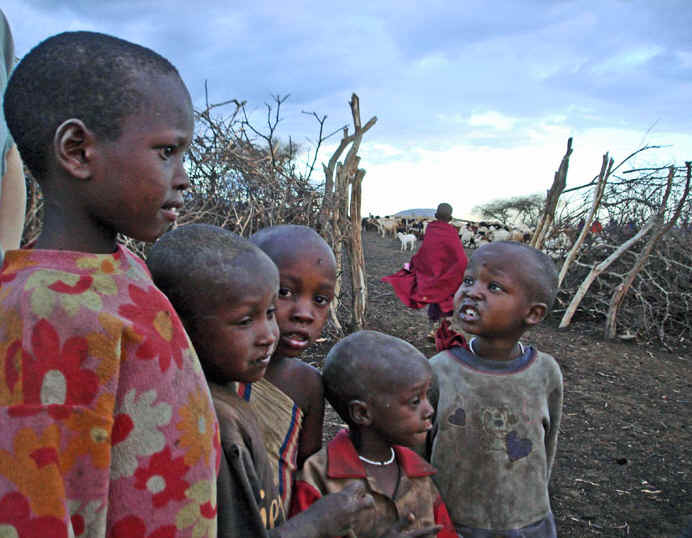 William, here on the Shira Plateau, is married with two kids. He wants to be a head guide on safari's and is now, post-trip, taking the nine month course to qualify. Safaris would be easier physically and give him more time with his family. 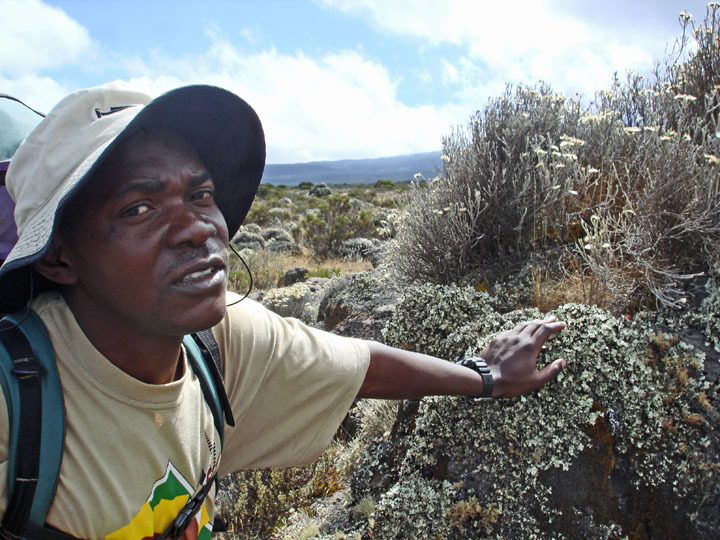 He called the Lemosho Route the most difficult he guides because of the length of time at higher altitude and the up and down terrain. 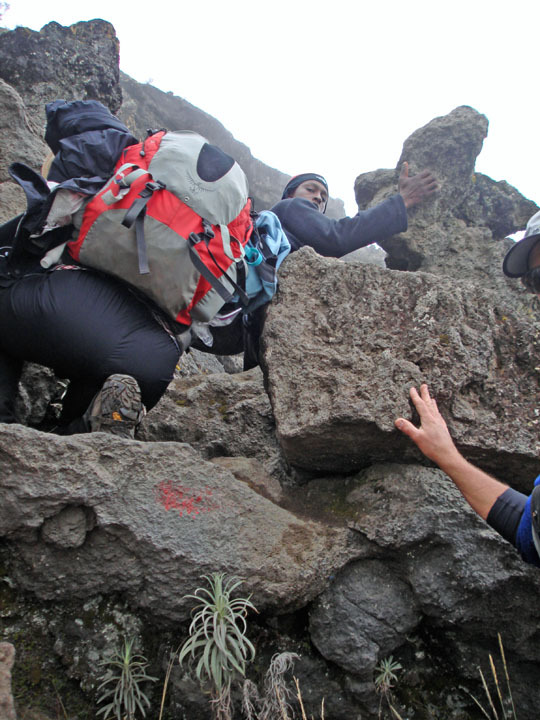 Leaving the plateau and climbing up Shira Cathedral at 12,900 feet, the afternoon mist again rolling in fast and hard. This was a spooky place . . . . It's getting serious . . . . . we pass the local ambulance. From now on, no more wheels if you have to get down in a hurry. Pitching camp in the gloom at the second Shira camp, 12,800 feet . . . .
On the way to this place, we were crossing a level plain and then abruptly turned upward. My breathing correspondingly became heavier and, as I was trooping immediately behind Kaen, I saw him tilt his head to one side and suddenly cut his pace in half. Later in the evening, I quizzed him about it, wondering if that was one of the tricks of being a head guide. "Did you alter your pace when you heard my breathing change?," I asked. "You saw that?," he replied, eyebrows going up. Pause. "Yes, I listen to people breathing. I drop back to listen too. I listen to everyone. It tells me the pace that is best." 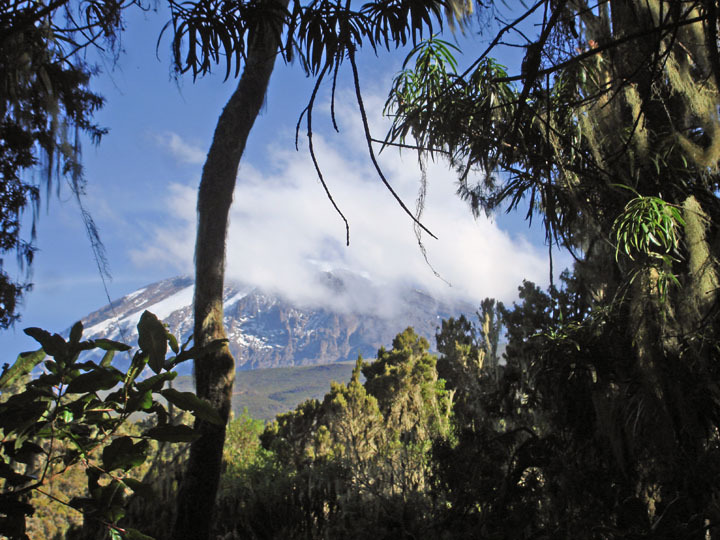 We wake up to a beautiful view, Mount Meru in the background, the Shira plateau in the valley. Comically, I almost ended my trip right here when I nearly slid over the back of this icy rock while setting up for this picture. Starting out, clear as usual but wisps of clouds starting to form. The weather had a regular pattern, created by the mountain itself, clear in the morning, fogging up in the afternoon. 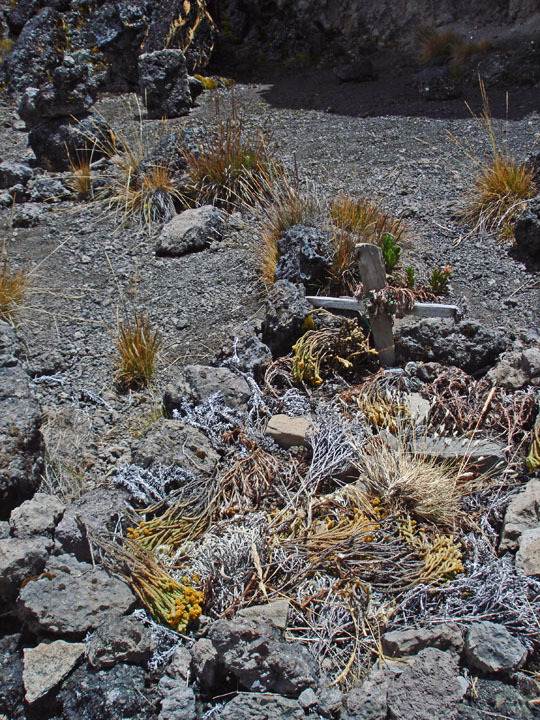 On the way up to Lava Tower, at 15,300 feet, we pass a weathered memorial to a woman who died at this spot. This is a difficult day, everyone in our group now at the highest point they've ever been. As we are nearing our objective, I'm having trouble focusing my eyes on the boots in front of me. As we arrive at camp, I have red spots swirling in front of my eyes and a headache is coming on. Not good signs. I'd spent the day trying to keep my breathing confined to my nose, to help with hydration, as the guides and literature had recommended. That seemed to earn me a bleeding, dust-clogged nose and I abandoned the practice two days later. Some drugs, including diamox, seemed to clear up my headache around midnight . . . but the rain turns to snow. It's miserable. We'd all like to forget our night at Lava Tower . . . . . not for the cold necessarily but rather our first attempt at trying to sleep at 15,000 feet. Most of us stared at the ceiling of our tents, shivering, some with headaches, for about 8-10 hours. 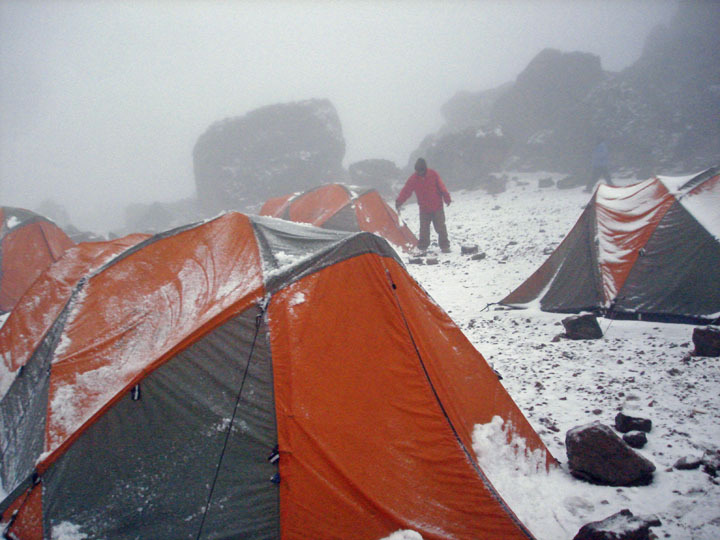 A few nights later, also at 15,300 at Barafu, it seemed far easier to sleep. As would prove the case for most of the trip, Zeinab would have no trouble with altitude, happily snoring through much of the night. And a crappy good morning to you too!!! Self-portrait. Through the night, I'd slept from about 7:30 to 10 p.m. and then was up until this picture at dawn. My notes read: "Every time I nod off, I'm jerked awake as I gasp for air, sometimes repeating this cycle three times in a minute. About 5-7 gasps and my breathing settles down, but not enough to sleep since the cycle starts again." Kevin, if I remember right, reported the same problem but solved it by rolling onto his side . . . . but that technique didn't do anything for myself. Two days later, at this same altitude, acclimatization would help me sleep easily. Oddly, although it may not look like it, I went on to have a really nice day, probably the best of the trip. Morning at Lava Camp . . . . . I can't be sure, but I think that's Edward and Aaron in silhouette. My small Cybershot had some small stains on the lense that I was never able to successfully remove, the effect coming out only on telephoto shots. 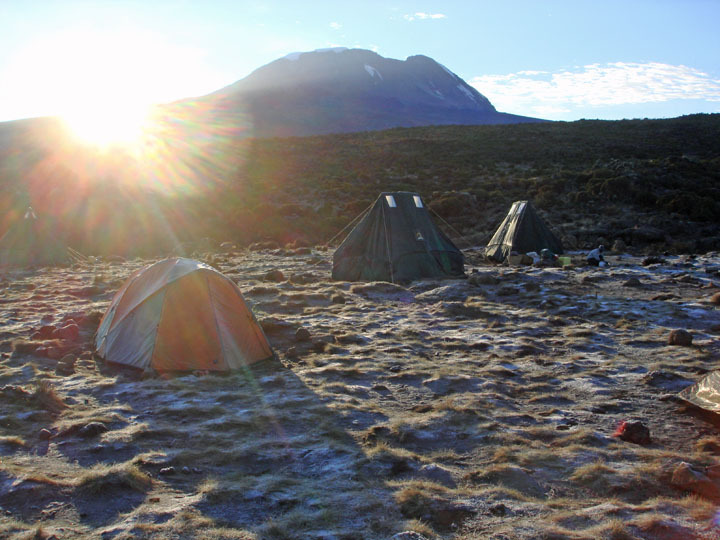 Leaving Lava Tower, the sun rises over the Western Breach, another route up to the summit of Kilimanjaro. It's a dangerous way to go up, three Americans killed in 2006 by a rock slide, caused variously by receding ice or strong winds, depending on which account you read, and other accounts of deaths along this route. Another account had a father/son team walking past a South African woman who had died near the top of this face. The route was closed at one point, but we did note people descending from there in the morning, before this picture was taken. Leaving Lava Tower behind. We had camped on the other side of it, coming down from the right. In this place, moisture from fog and rain in the afternoon freezes through the night, pushing dust up onto tiny arrows of ice on the trails . . . . . . and then the ice strips melt quickly in the morning, appearing to fall over like domino's. Then the process repeats itself. The start of a roller coaster day, descending from the snow . . . . within an hour, we would shuck our heavy clothes for shirtsleeves. We were going from 15,300 feet to 13,800 by the end of the day. For a moment at least, down into the Baranco Valley. The plants are Groundsels (Senecio Kilimanjari), where the dying leaves fold over to protect the growing trunk, rather than fall off. 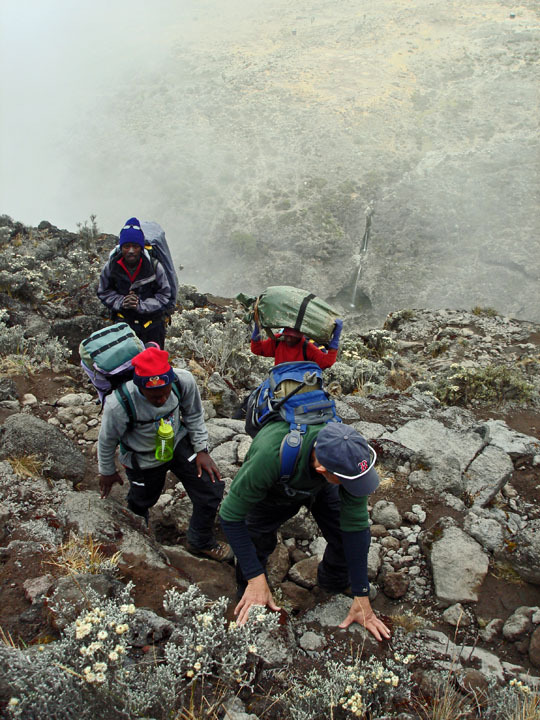 Then it's the 700 vertical foot climb of the Barranco Wall, fairly straight up and one of the few places where a fall could be serious. Tony leads the way, with waterfalls in the valley below. Baranco means "wall" in Spanish so saying "Baranco Wall" is also saying "Wall, Wall." But it sounds cool anyway. Edward on the Wall . . . . . . this version was a first place winner in the "Photographers Choice, Black & White" division at the Millarville Fair photography competition, 2009. Way to go Edward!!! Edward, well experienced in this place and admitting he was a little unnerved the first time he did this as a porter, shows where the best hand holds are. The ever-smiling Kaen . . . . . and Aaron in the rear typifying the dilemma of those who have to carry large piles of stuff on their heads up this wall. Then downhill again, across a moonscape . . . . . .
. . . . . . which turned into this lush, misty place. 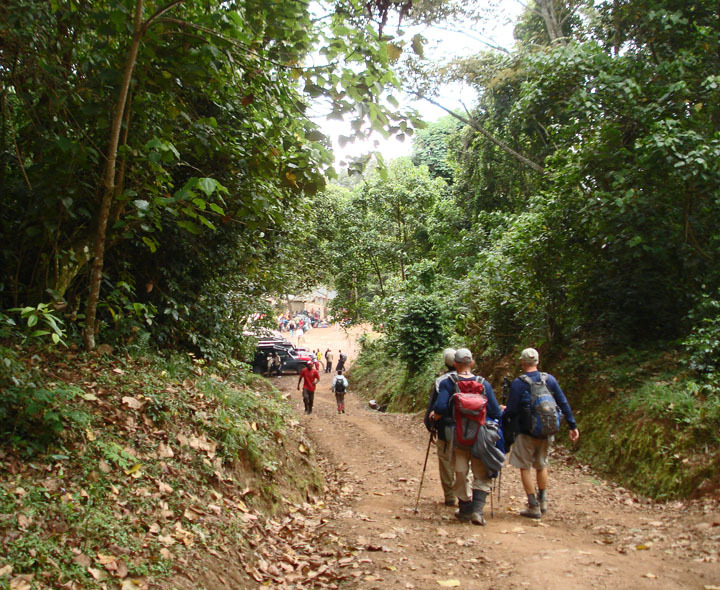 And there was another steep hill yet to climb to Karanga Camp, back into a desert-like area, before the day would end. Sunrise . . . . Karanga. Our dining tent awaits!!! Crazy to have tables and chairs and a chef way up there. The food was consistently good, all things considered, and plenty to eat. 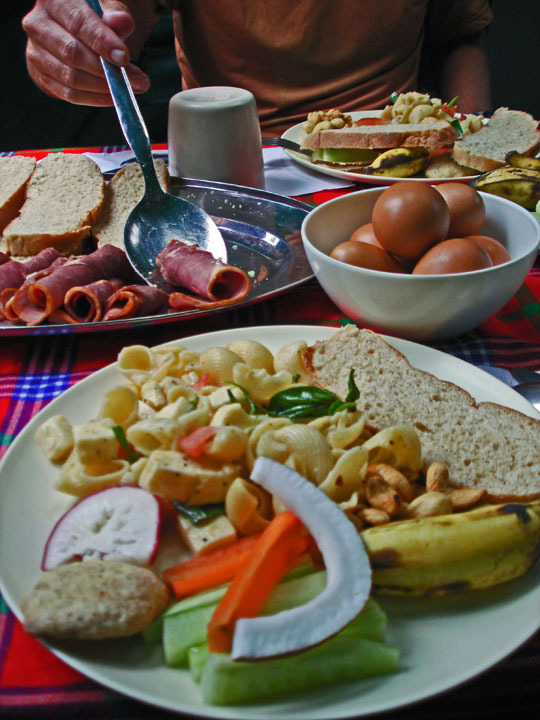 Pasta's, rice, stewed or boiled meats, desserts, eggs, bacon, toast, etc, etc. 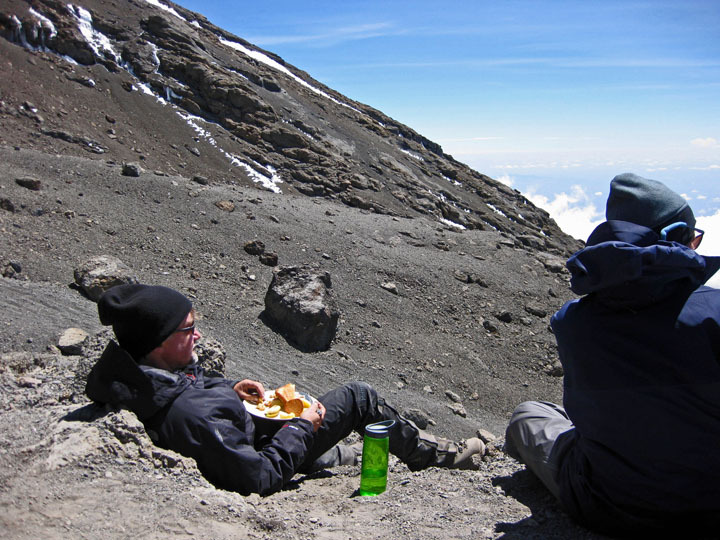 The problem became finding an appetite at this altitude and our guides did mention, out of earshot of the cooks, that eating meat above 15,000 feet was not a good idea. Takes too much energy to send through your body. A common lunch. . . . . . hardship did not extend to the dinner table. But the higher we went, the harder it was for me to eat. Others were different, including Kevin who was awesome wolfing back his meals from the bottom to the top of the mountain. The small bananas had a tangy taste to them and were a favourite of most. 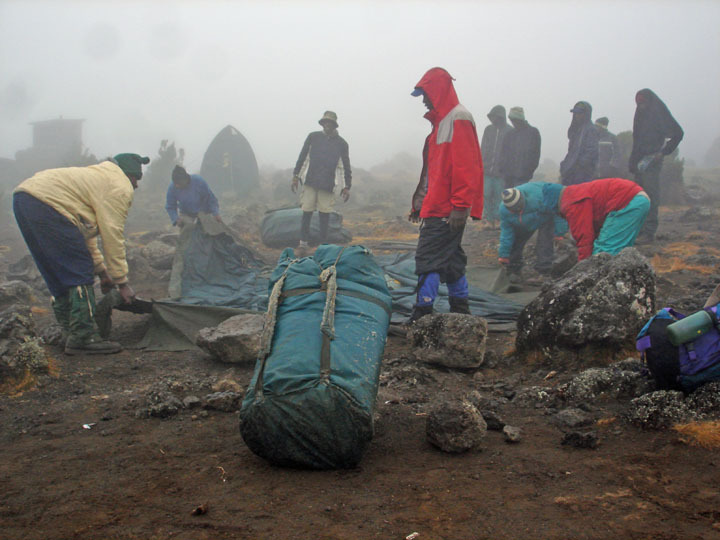 Later at Barafu, in the fog of the afternoon, a hurried troop of porters carries a trekker in what appeared to be an oxygen bag down the mountain, reminding us again why nothing grows here or lives here. Sitting in this place watching these guys trot by was followed later by a trekker returning from the top who would tell us only about 25% of those attempting the summit this day had made it, the remainder turned back by high winds and cold. Our chance would come the next day. 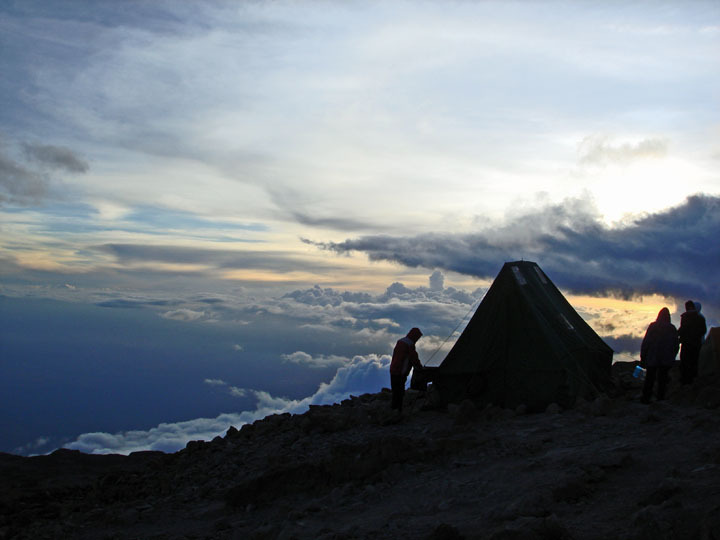 Watching a sunset at 15,300 feet, Barafu Camp, the jumping off point for the summit the next day. The lights of Moshi would emerge below us in the darkness, about 10,000 feet down. 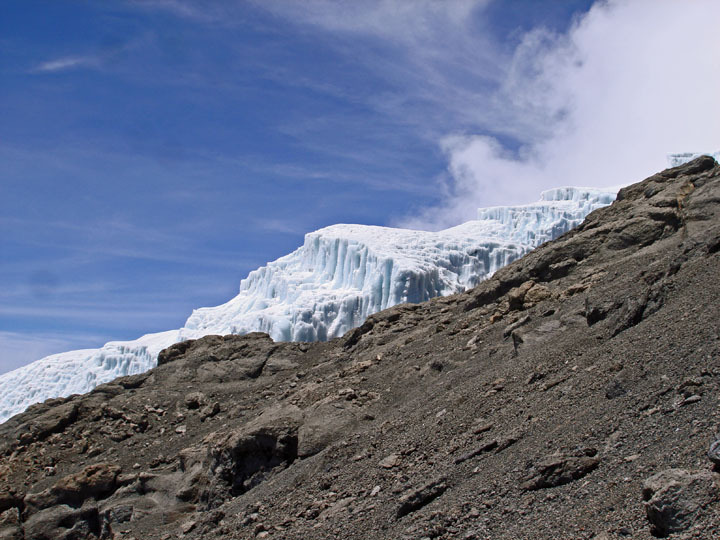 The trail we had climbed from Karanga up to Barafu . . . . not surprisingly, "Barafu" means "Ice" in Swahili. Summit morning, about 6:20 a.m. here. We had started in the blackness of 5 a.m. and would reach the top 7.5 hours later, in the early afternoon, a distance of only six kilometers but 4,000 feet of altitude gain and a sizeable struggle for myself, loudly whooping and gasping for non-existent air but then, of course, I could have slowed down a bit if I wanted. Nevertheless, it seemed to come down to genetics and what each of us is capable of getting out of a single breath. It's why a 70 year-old can do this but a 21 year old soldier would struggle earlier . . . . . something you're either born with or born without, so one shouldn't take it personally. On this day, fortunately, I was never at the point where I was having trouble focusing, seeing spots or suffering from headaches and, in truth, none of our party of five were ever in the lurid phases of vomiting, hallucinating, etc, described in the New York Times account. 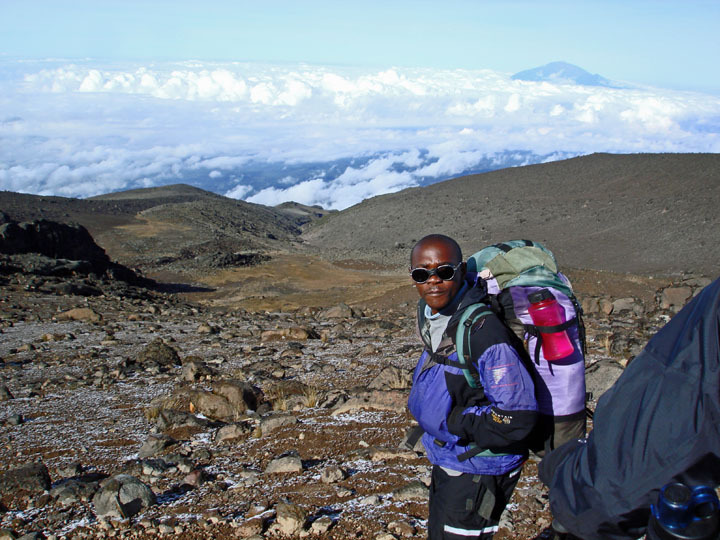 In this photo, we're going to Stella Point (18,800 ft) on the crater rim, easily the most difficult part of the climb, to the right of the glacier above, then another 45 minutes or so around the crater to Uhuru Peak at 19,340 feet. After the first few hours, we paused and I asked Kaen how far we'd come. "One kilometer," he said with a straight face. In my addled mind, I ran the math and it didn't compute. "It's 1.6 kilometers or one mile to the mailbox on the highway from my house. That's something I can walk with my dogs in 15 or 20 minutes. I know what it's like to walk a kilometer. We've been going for hours. I think you're lying Kaen." I made the accusation flatly, with humour, but I also meant it. I sincerely thought he was fibbing, or most likely, just joking with us, which he was wont to do on occasion. But he'd said it with a poker face, in all apparent seriousness. It seemed impossible that we'd traveled such a short distance. Hours to walk a distance I can run in five minutes? "You do not believe me?" said Kaen, looking me in the eye, more than modestly offended. "I am not joking." I remember his syntax being perfect, which was probably an ominous sign. 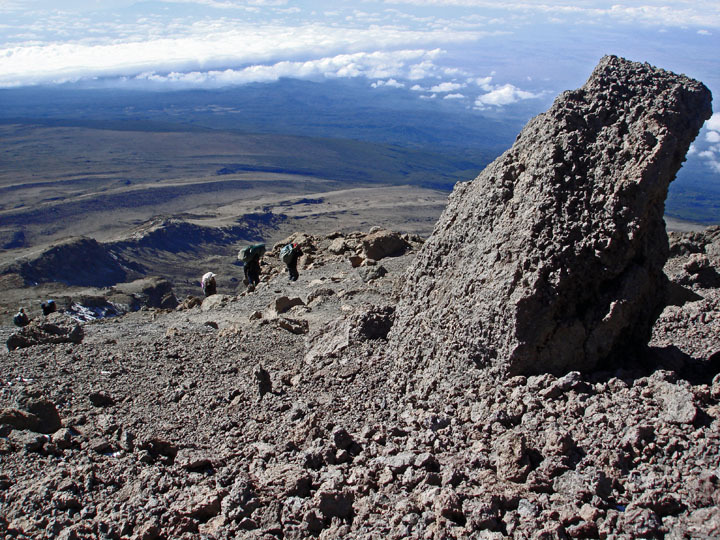 A bit later, as we topped a rise, looking down, I could see the outskirts of Barafu, where we'd originated, in the distance. And very obviously it was under a mile away, perhaps about 1.3 kilometers. A little demoralized, I quietly apologized to Kaen in front of the group. And apologized a second time, this one with more sincerity, when we were alone on our descent. He accepted with good humour. I was, after all, not his first encounter with a know-it-all tourist. Throughout the trek, Kaen would mesmerize us with his ability to predict when we'd arrive at a destination. A conversation would go like this: "Kaen, how long to Forest Camp?" He would think a second, then answer: "Twenty-six minutes." Not 27 or 25, but 26. And 26 minutes later, we would arrive. It figures a guy who was on his 157th trip to the top would know these things. In other words, I should have known better than to challenge his estimate of how far we'd traveled on this day. A classic case of: "If you're not going to like the answer, then don't ask the question." However, Kaen did tell us that once we reached Stella Point, it would be an easy, fairly flat walk to Uhura Peak. That's not quite the way it worked out. There was some universal grumbling about that description. So he picked his spots. Earlier on summit day, leaving in the pitch black of early morning, I had neglected to put on suntan lotion and would successfully fry half my face on the ascent, screaming in horror when I finally saw myself in a mirror days later. Most also burned their lower lips as well, an odd malady that's apparently normal for those gasping at higher elevations. It took about a week to get feeling back into my lower lip. 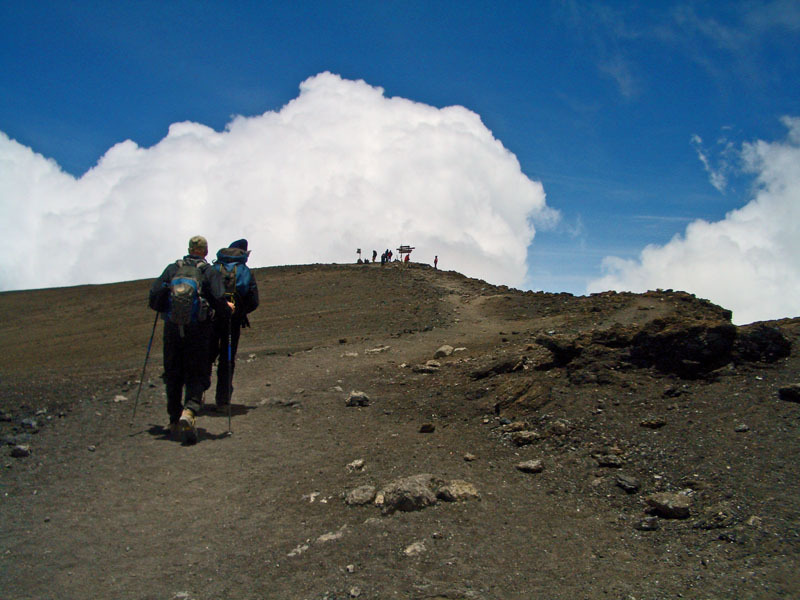 A good many of those ascending Kilimanjaro start around midnight, reaching Stella Point around daybreak, Uhuru a little after that, then walking down to the forest, all in one very long day. We heard their stirrings in camp in mid-evening and then they were gone. Summit day, the sun well up now, soaring above the clouds, we're in a place where the violence of an ancient volcano is still evident, as is the curve of the Earth. 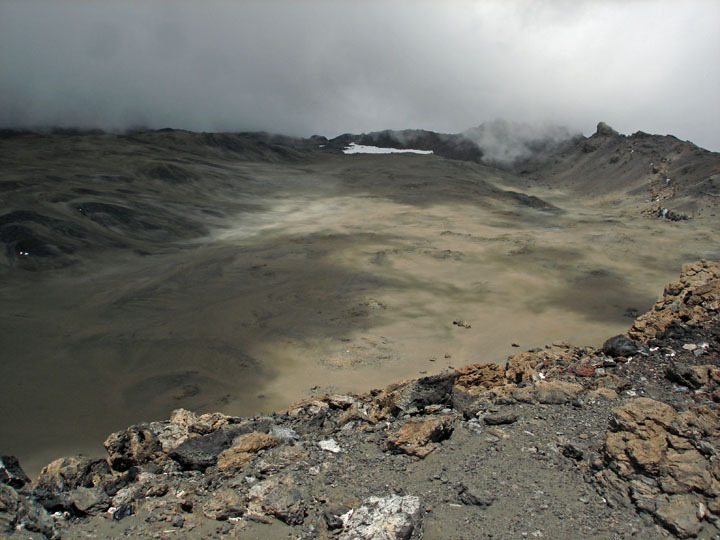 In the crater above, there is a very large hole called Ash Pit that is still venting. 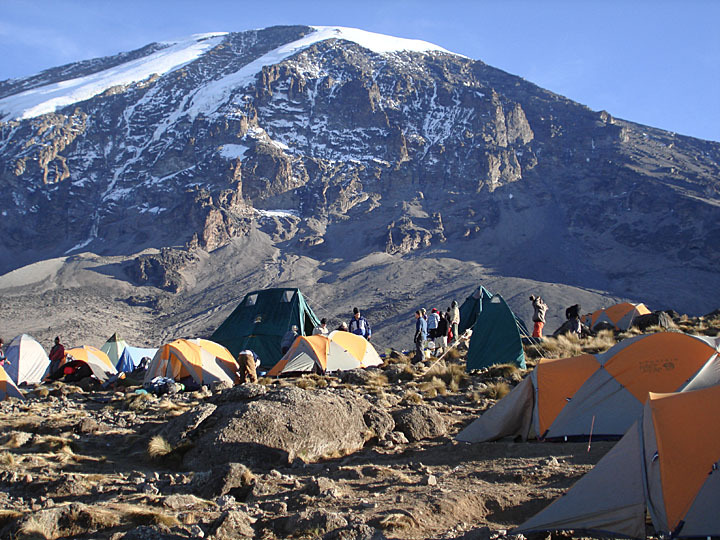 In the picture above, on the rocky spine, is Barafu camp, our starting point on the day. It's about 9 a.m. here. We've been walking for four hours and have gone only about 2 kilometers, even though we've had only brief stops for water, lasting a few minutes each. A break for brunch at about 10:30 a.m. Photo courtesy of Kevin. 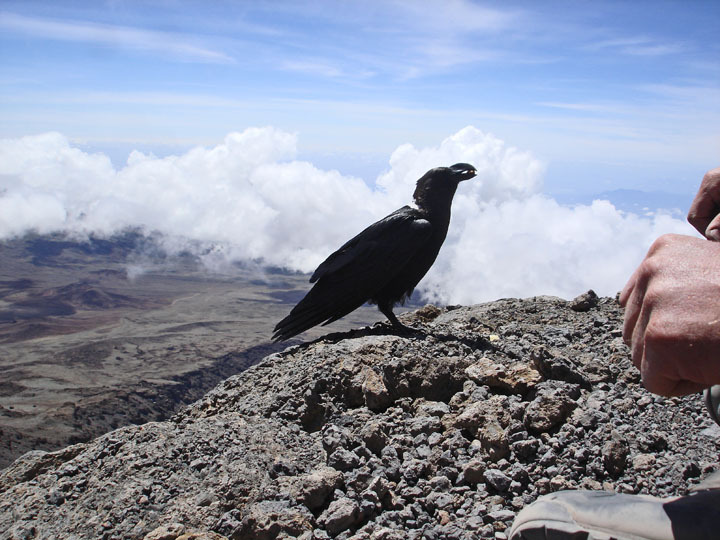 Okay, one thing lives up here, the local version of a Raven, this kind with white markings around it's neck and apparently immune to the effects of altitude. It's also illegal to feed them the peanut it's holding, so we'll keep the identity of those hands on the right a secret. "Hey, look over there." 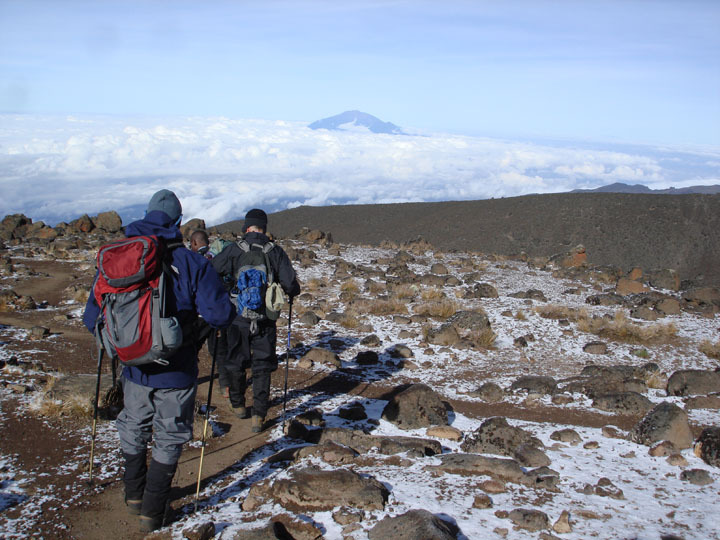 We were so focused on the path in front of us we nearly missed the first eye level glimpse of the famed Snows of Kilimanjaro, the patch of snow in the photo above. 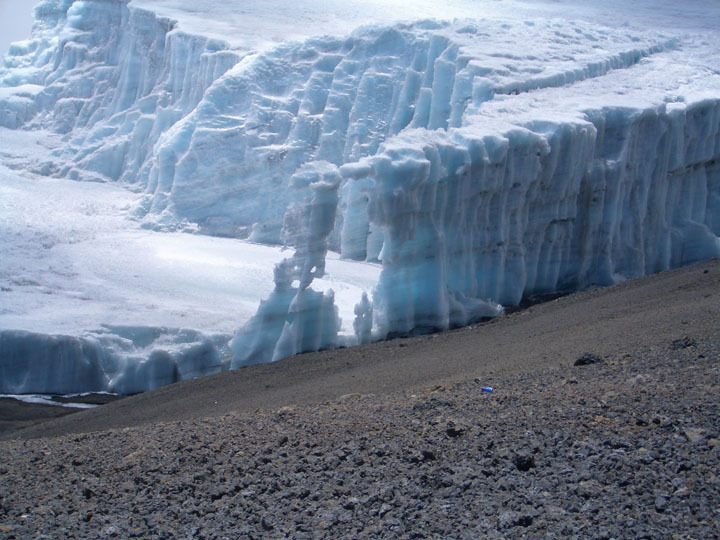 This is the Rebmann Glacier. The glaciers here, by and large, aren't melting. They're vaporizing into the atmosphere, through a process known as sublimation. 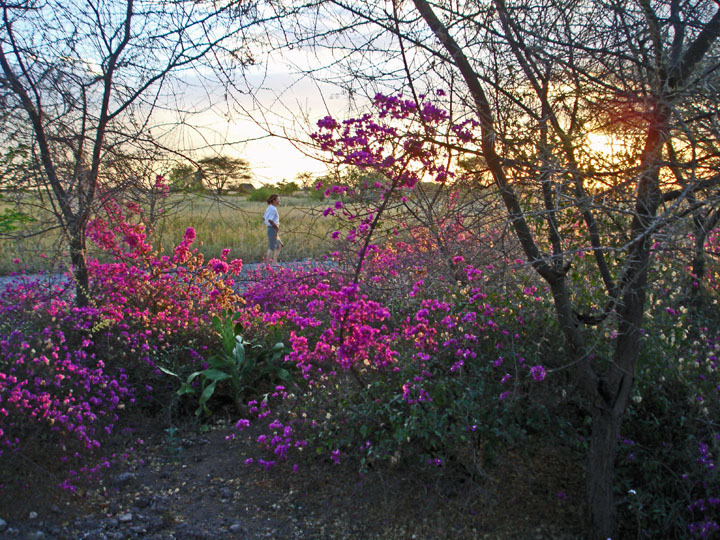 The water that does make it into the cultivation areas below is lessening, causing distress on the local populations. Tanzania, although small, has a population greater than Canada's. 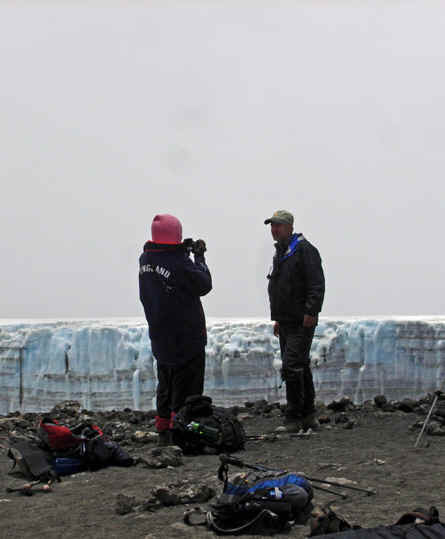 Kevin, Peter and Zeinab were already on top of Stella Point when I finally poked my nose over about 10 minutes later with Edward, the assistant guide trailing and Kevin capturing the moment. 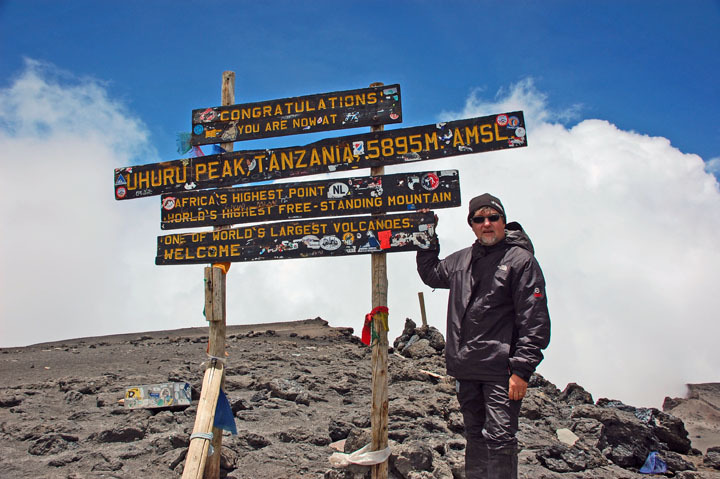 Reaching Stella Point or Gillman's Point - both at roughly 18,800 feet - is enough to get you a Kilimanjaro Summit certificate since you've reached the crater rim . 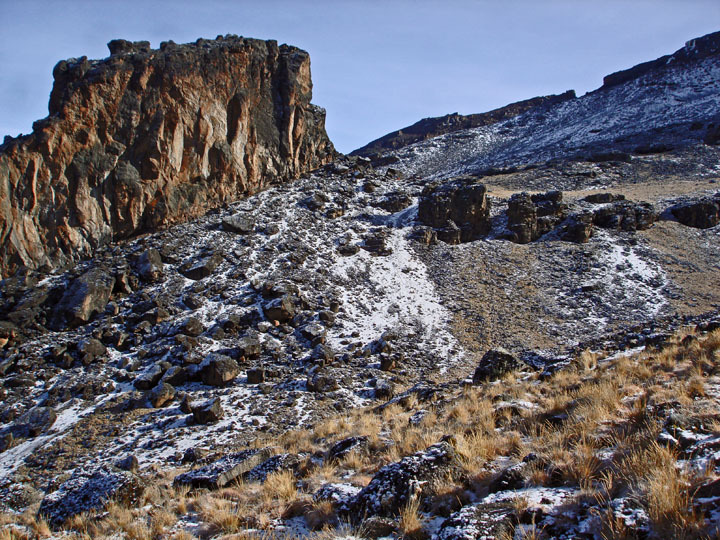 . . . . but Uhura peak, the true summit, is still 45 minutes away and about 600 feet higher at 19,340 feet.. This is about 11:25 in the morning, six and a half hours after leaving Barafu. Closing in . . . . . but not quite. Only about 15 more minutes to go to Uhura. I'm done like dinner and it's all dependent on guts at this point. Just shoot me now!!! 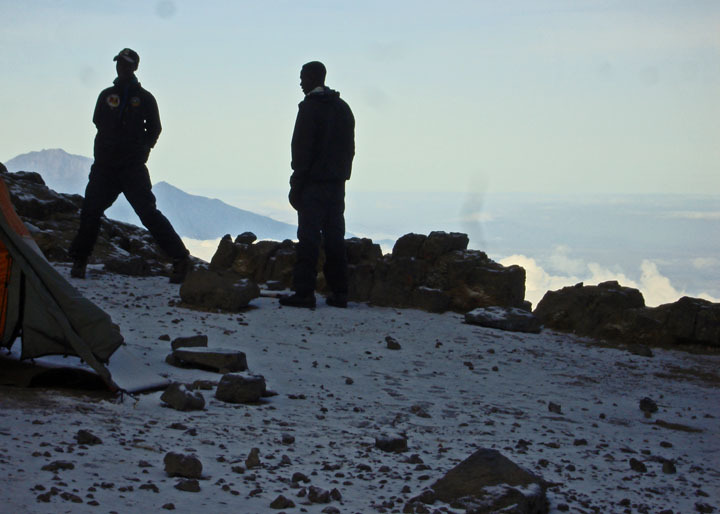 In the distance, the highest point in Africa. Almost there. 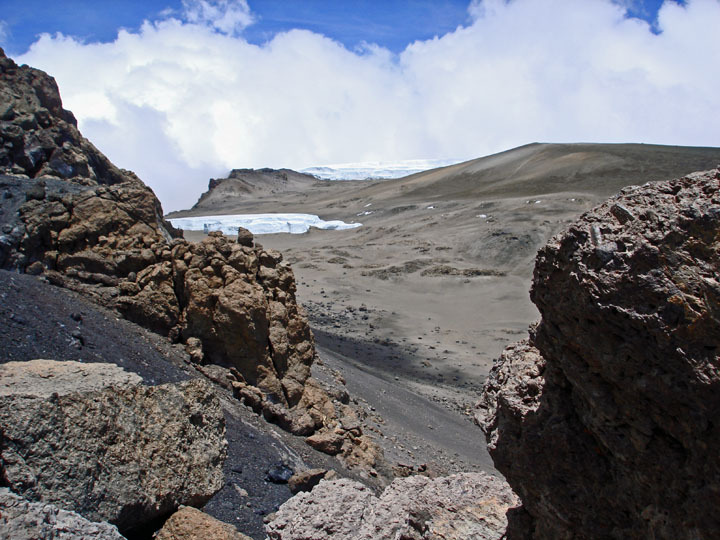 As we near the Uhura summit, with the steep climb to Stella Point, the crater rim, behind us and the angle of attack flattening out, the view I commonly had of my peers . . . . . one of receding backsides. I find even this modest gap impossible to close. But we're almost there. Many accounts you see or read of this place would have this path swathed in snow and ice . . . . . but it was bare for us and, truthfully, a fairly balmy day. In the Washington Post upon my return, I would discover the obituary of an ex-CIA agent who would have died very close to this spot only a few weeks before this picture was taken. 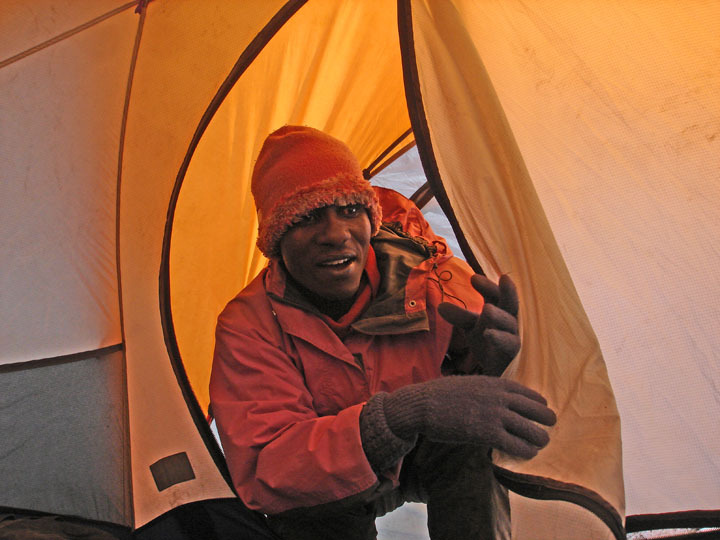 At the bottom of his obituary are his last fateful last words, an admonition uttered to himself as he dug deep to get to the summit and relayed to his brother by another trekker: "C'mon Ken, c'mon." 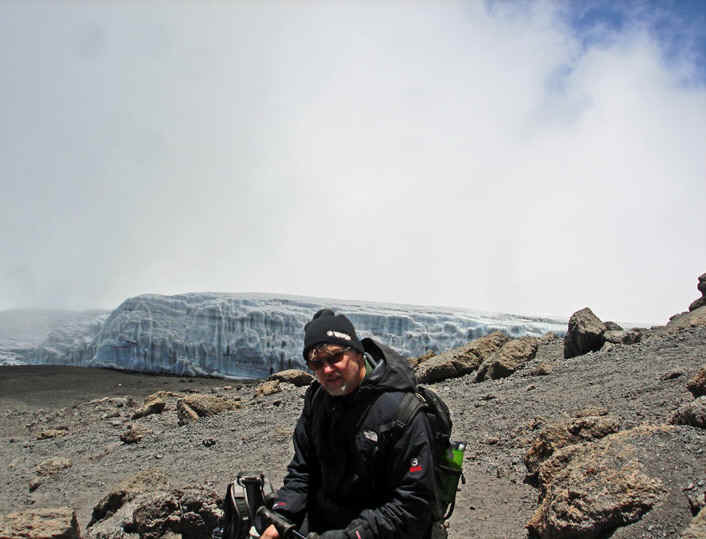 His widow a few months later would post a message on an MSNBC Kilimanjaro blog, warning of the dangers of altitude and describing her 48 year-old husband as "extremely careful, well-prepared and in excellent physical shape." It seemed surreal to read that and then look back at this picture. An unlikely spot for an interview. A unperturbed Kevin, who had a great day, gives his thoughts for the record, as did I later. I'll be getting a personalized copy of our trek video in the next month, which should make for some interesting viewing and no doubt the contrast between Kevin's experience on this day and my own will be self-evident.. I hadn't ordered it beforehand but couldn't resist after it was all over. I will hopefully be laughing with myself, not at myself. 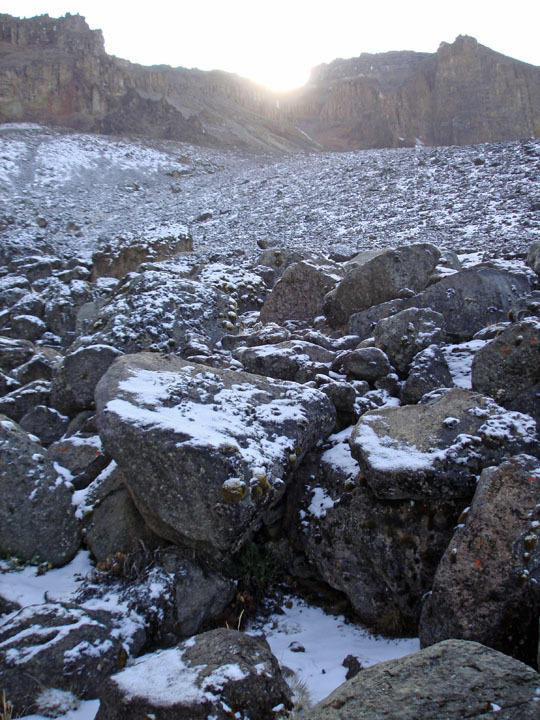 The summit was a barren, wild and beautiful place. We all wanted to descend to actually touch the glaciers but that would have meant a second climb out, even from a shallow incline . . . . and even those who had done well this day couldn't face another, albeit modest, climb. Two views inside the massive crater . 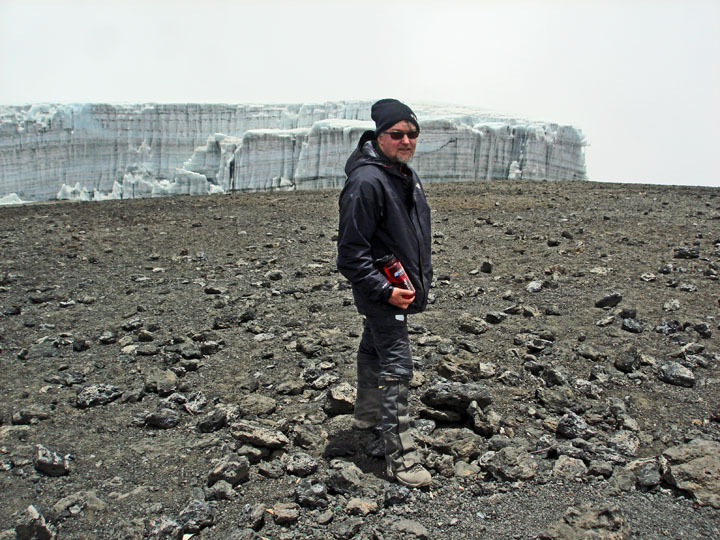 . . . .
We were originally scheduled to camp inside the crater, next to the lowest glacier above I believe, at roughly 18,800 feet, but having gone through the experience of camping at high altitude already, our appetite for that kind of derring-do adventure had evaporated somewhat. It was sage advice from Kaen to summit first and then decide about Crater Camp (although we made the decision the night before). 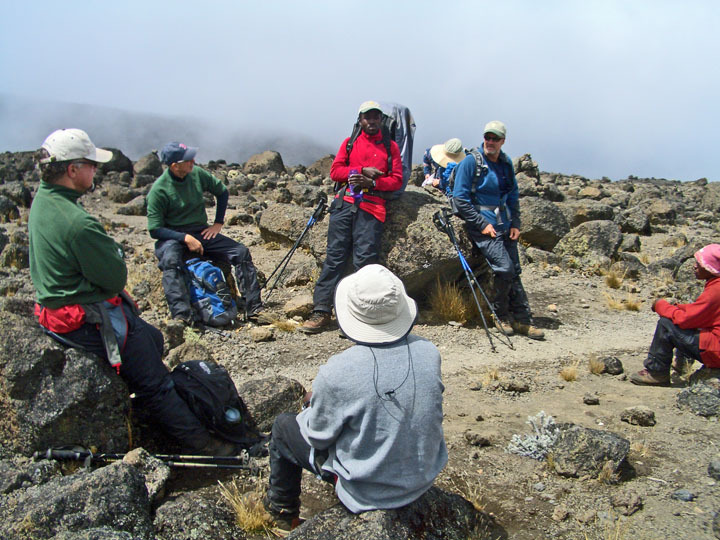 Camping up there first, as the original trek itinerary called for, then spending two or three hours climbing a scree slope to get to Uhuru peak the next morning would have probably meant a far lower success rate for our group of 13 than we ultimately achieved. In that scenario, I'm pretty confident the picture of me at Uhuru wouldn't have happened. 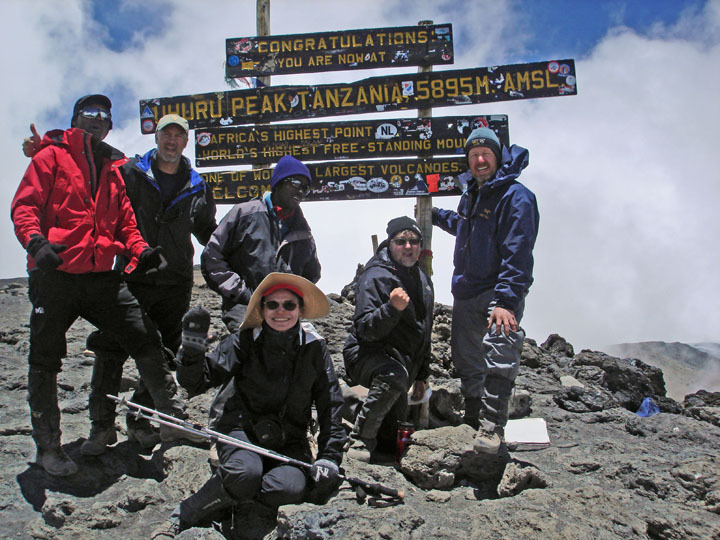 Among our five, we elected to summit first, then return to 15,300 feet and stay the night at Barafu. 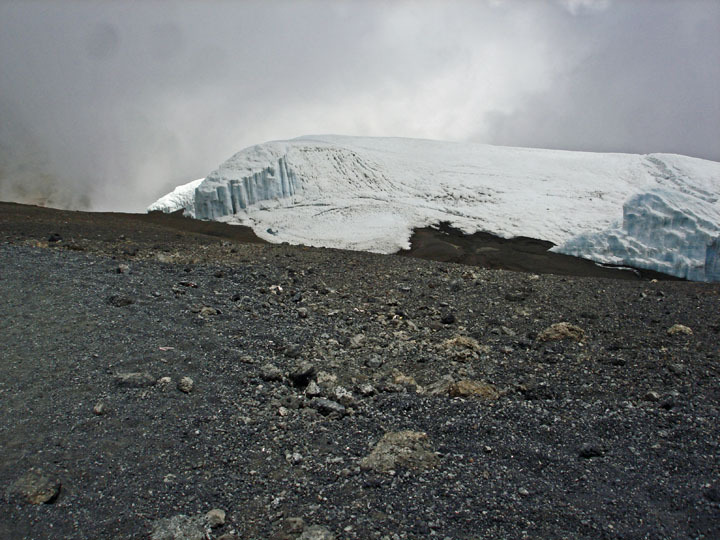 Truthfully, our guides, although well acclimatized, were also relieved by our decision not to camp at this altitude. 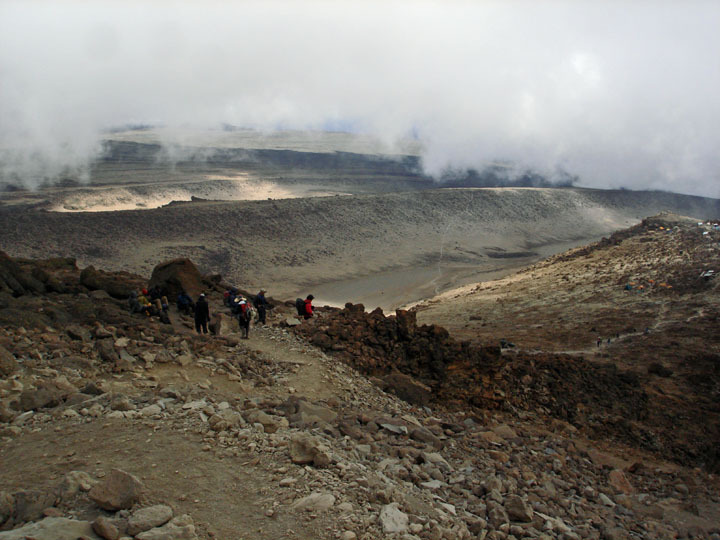 A few of our 13 DID eventually stay at Crater Camp, after reaching the Uhura summit, and suffered through a rough night, including one gent who was sufficiently alarmed by his condition to waken the doctors on the trek to check him out. Early the next morning, a few launched themselves downhill and kept going right into the jungle and then Arusha, all in one day. 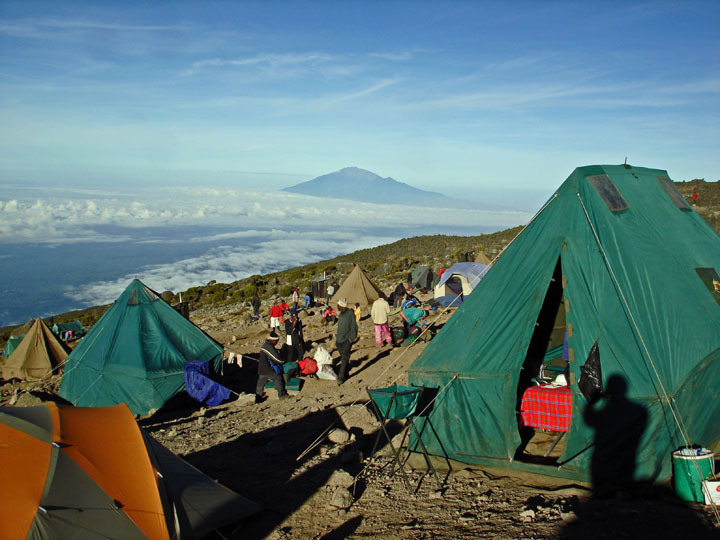 I would later find statistics showing the greatest number of deaths on Kilimanjaro come from camping at this highest altitude place. After the crater photo above, it would be almost an hour and a half before I worked up the gumption to take another photo and almost two hours for the one above as I begin to catch up to the group again after drifting behind, the outskirts of Barafu camp coming into view on the right. My sleeping bag was a welcome sight and I conked out immediately in camp. After rousting for some Chicken Noodle Soup at supper, I slept right through to dawn, quite a contrast from Lava Tower a few nights earlier, also at 15,300 feet. "You still alive man?" 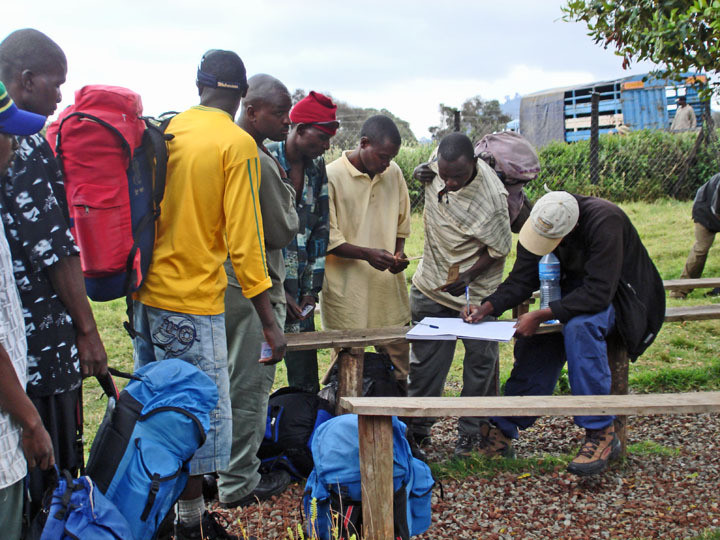 - Okay, he didn't say it quite like that but the intent of Aaron was fairly clear as he checks in to make sure I was resting, shortly after we'd returned to Barafu. The eyes of Peter and Kevin were as big as saucers when I staggered into the dining tent a few hours later . . . . . they'd been laying odds, they said, that I wouldn't make it for supper. I probably would have taken some of that action myself but I knew I had to eat something. Eventually, Peter and Zeinab also showed up. 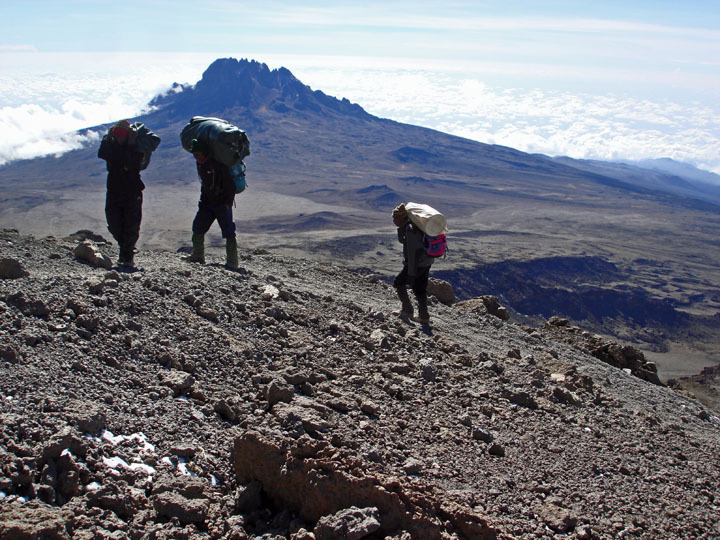 Upon returning to Canada, as I was reflecting on all of the above, there was coincidentally a documentary on the NHL Network of Zdeno Chara, all-star defenceman of the Boston Bruins, attempting to reach Kilimanjaro's summit via the Rongai Route. As a professional hockey player at the highest level, Chara is obviously aerobically fit, probably more so than most professional athletes, as well as tough as nails . 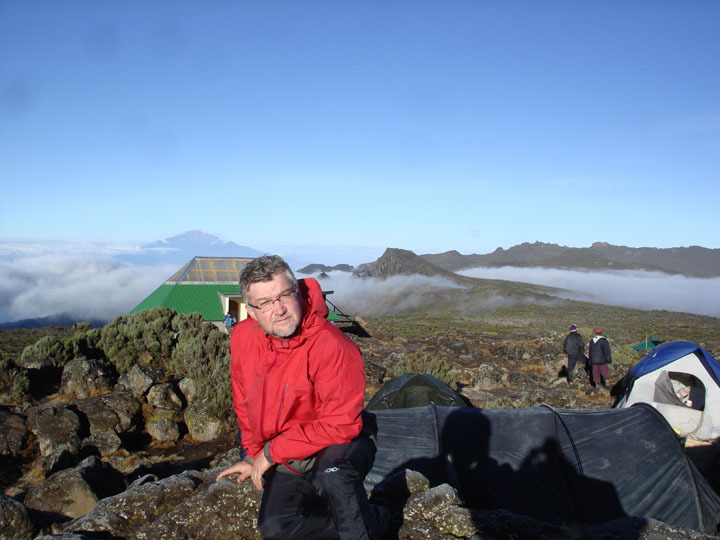 . . . . but complained he was whipped by "zero energy," the same phrase I had used, and turned back at Gilman's Point, at 18,850, with Uhuru Peak still an hour and a half away. 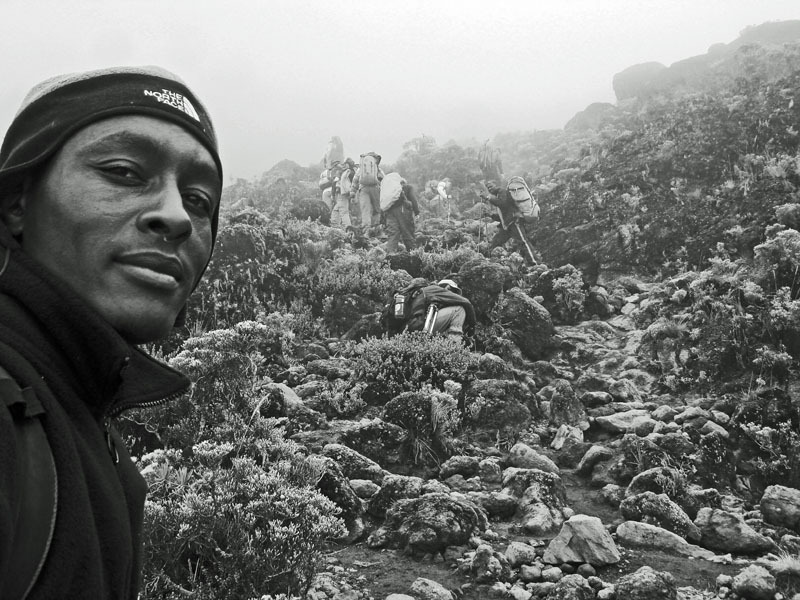 Chara's tale seemed to reinforce that everyone has a different experience on Kilimanjaro, that this can be modest exercise for some or a difficult and occasionally dangerous thing to do for others, and that success is not necessarily dependent on fitness, but rather your inborn ability to acclimatize quickly. Two days after the summit, after landing in Amsterdam, a full bore cold would overtake me as soon as I stepped off the plane. I do wonder if the early moments of that cold might have been present on summit day, making it more difficult . . . . but that's a puzzle that will never be answered. 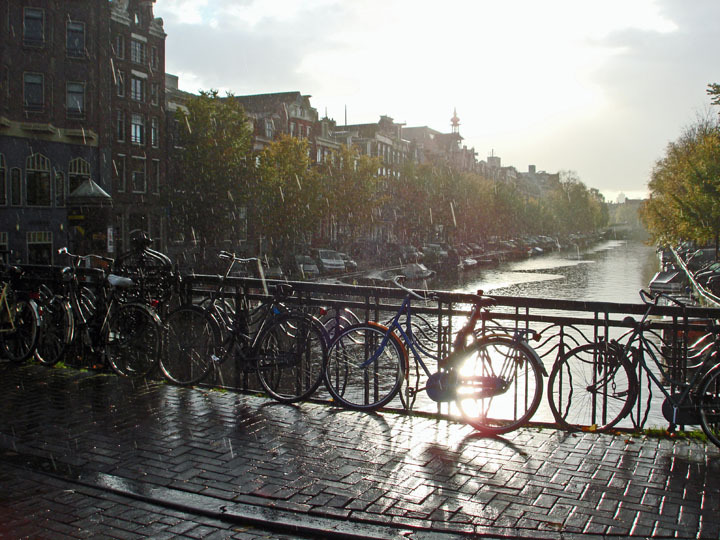 Nine days after summit, in sea-level Amsterdam, I'd run one of my faster half-marathons, no doubt helped by the earlier high altitude acclimatization. 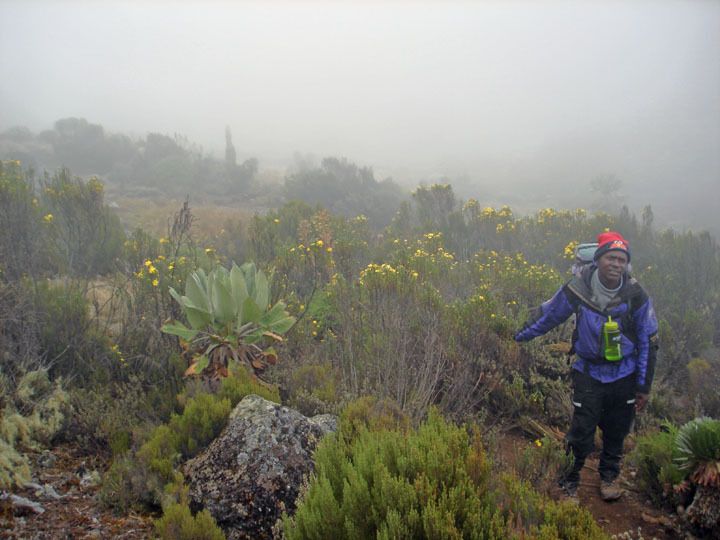 Edward, on the descent trail to Mweka where we would camp under the forest canopy of 10,000 feet . . . . . It was Zeinab who said to Edward and William in a heavy, Egyptian accent: "You guys have such beautiful smiles. So natural!!!" If black men can blush, then they did. Most of us will remember this as a very, very dusty day, after struggling with oxygen deprivation the day before it was now dirt clogging the lungs. But we were all happier to go lower and lower and lower. If I remember right, we encountered "The 90 Second Hill" as Edward described the single upward inclination in terrain that we would have to weather in three hours of walking. Even that was a strain after the summit the previous day. 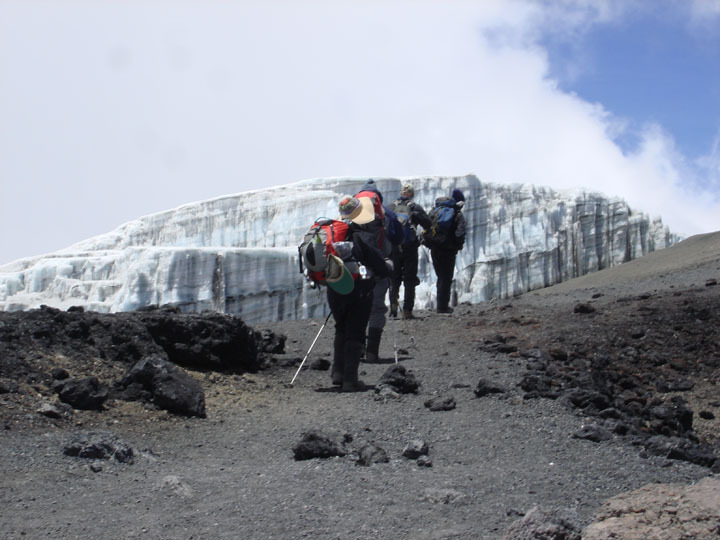 On Kilimanjaro, you ascend and descend through distinct climate zones, ranging from "cultivation," to "Forest" then "Heather" followed by "Moorland," "Alpine Desert" and finally, "Summit." Then the reverse. This is somewhere between Moorland and Heather. 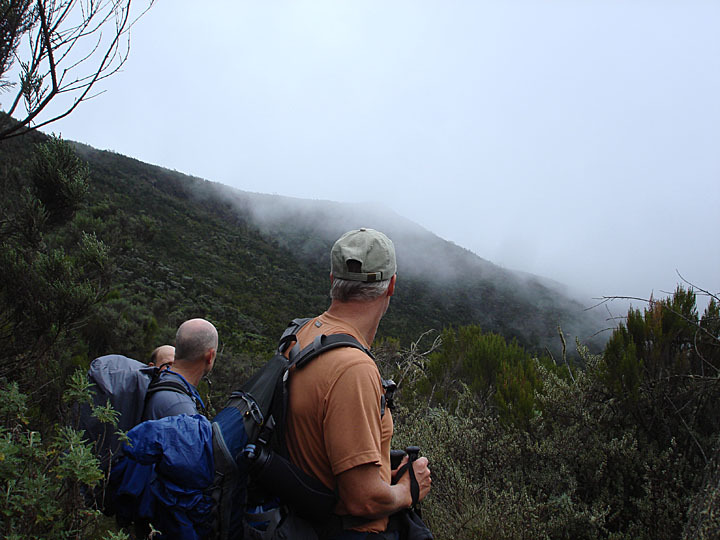 Last look at Kilimanjaro, through the rain forest canopy as we descend into the 5,000 foot area, cloud already starting the ensnare the summit. 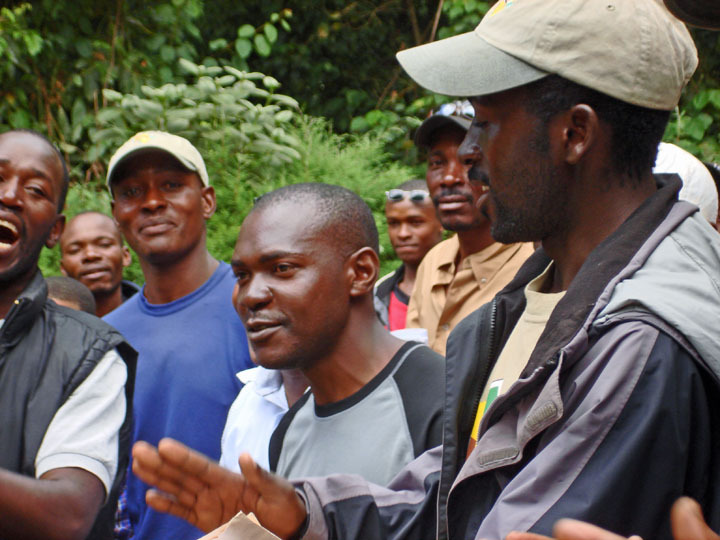 Edward, William and Kaen, along with all the porters, sing us a farewell song at the end of our journey at Mweke. Again, really, really good and well proud of their heritage. All of these guys have e-mail addresses, which we found rather astonishing in such a poor country. A last look at Africa . . . . . I was sitting in a Land Rover, ready to be taken to the airport only two miles away. The lady tourist in the distance had a better idea, catching the mood of the moment, walking out to catch a last sunset. I had walked off the mountain that afternoon, was transported to KIA Lodge and, along with Tony, given a day room with a shower to clean up . . . . . . and then . . . . those of us not going on safari, we were gone. Just like that. A harsh ending with a 12 hour flight to Amsterdam. Leaving this world to return to another. Upon stepping off the plane at Kilimanjaro International Airport at midnight, it was fairly easy shuffling through customs and then picking up my bags from the carousel. Then I stepped out into the reception area, where a semi-circle of people were holding up signs for various tour groups. I scanned from left to right then right to left and back across left to right once again, pausing carefully on each sign, but seeing nothing that said "Thomson." Thinking I might have missed something, I stepped through the group and went out the front doors. No one was there, just bats darting around lamps lighting the parking lot. At that priceless moment, I couldn't help but smile and laugh a bit at my situation . . . . . . . . it was midnight in Africa, I was alone with bats circling and I knew not a single soul or even really where I was. Perfect!!! I went back inside and asked one of the waiting locals in English if they knew of any Thomson representatives. A blizzard of Swahili flew out over the crowd and there they were, emerging from the background. We shuffled outside and I introduced myself to Tony. Soon we were a group of 13, laden with baggage and itching for adventure. As we moved across the parking lot to waiting land rovers, the bats were still circling but I was no longer alone. 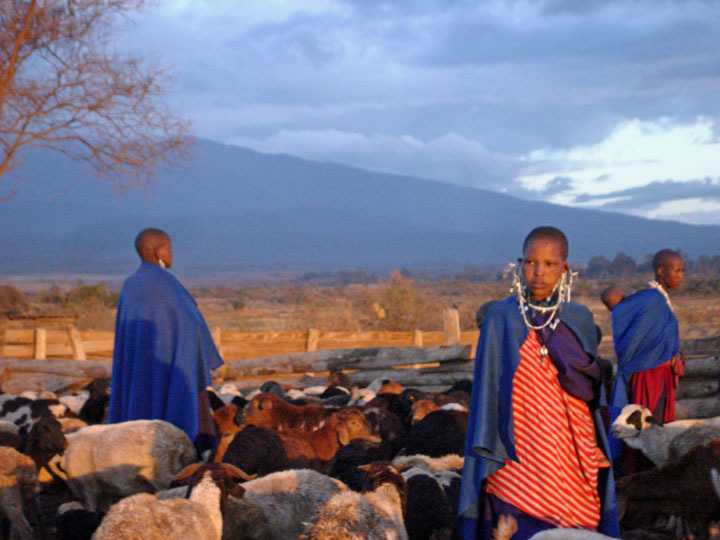 Maasai wives tending goats, the slope of Kilimanjaro in the background. While walking the territory in the background, we saw zebra, eland, an owl, wildebeast, gazelles, waterbucks and wild boar. Kids checking out Tom's camera. Funny moment came when I was trying for an eclectic shot of a sandal worn by a child and my camera targeting laser illuminated the ground, prompting a horde of kids to come shouting "Laser!!! Laser!!!" Tom's experience in Iraq probably served him well here, allowing him to mix easily in this compound where the kids flocked around him. Common street scene . . . . .
Amid all this, as we were motoring along, a decidedly uncommon sight . . . . a young, local teenager decked out in all the finest cycling equipment, all of it brand spanking new, including the only helmet in Tanzania, as well as a top of the line racing bike. It was an incongruous contrast to the rest of the countryside, but a strangely welcome one. 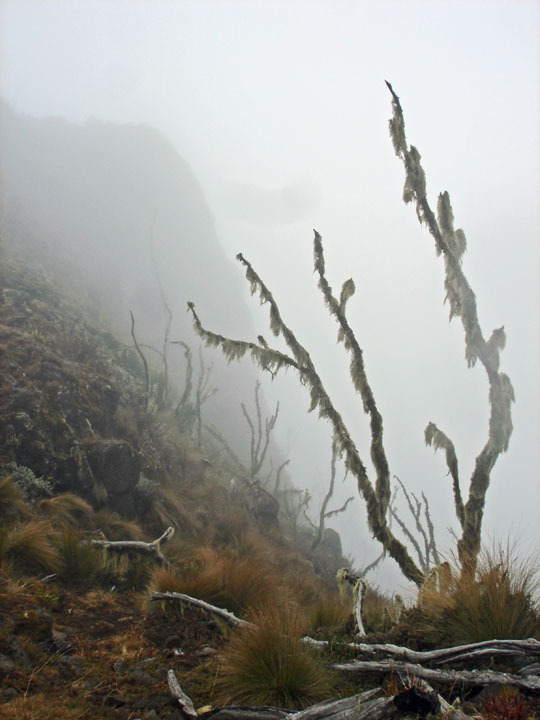 The terrain around the "cultivation" level of the mountain varied from lush coffee growing to drier spots like the above. The jumping off point Ndarakwai Ranch was operated by Maasai, including this hostess . . . . . . nice accommodations but a very cold bucket shower in the morning!!! 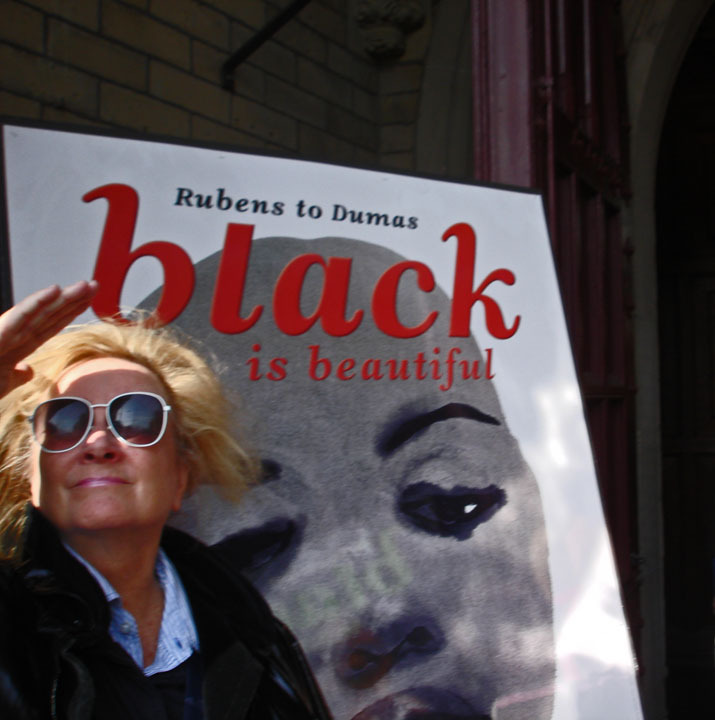 Upon leaving Africa, I stayed in Amsterdam for a few days . . . . . cooler, raining in this picture, and interesting. 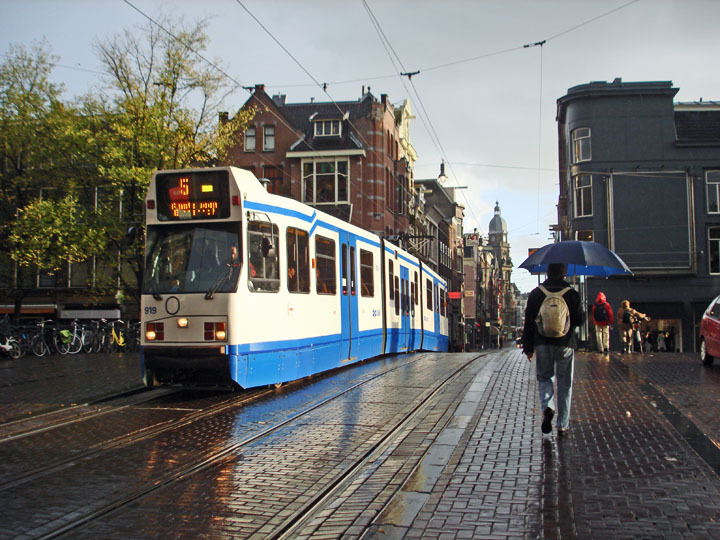 The Netherlands is the only country in the world with more bicycles than people, yet no bicycle helmets can be seen on the streets of Amsterdam, including on the heads of children riding on the handlebars of their parents bikes. Nor are there any of the mountain bikes that would normally inhabit a North American city. Instead, the bikes are all somewhat generic but very expensive, of the kind above, with the operators sitting up straight, without concern for aerodynamics. All of that is not a whine, merely an observation. Here's the whine . . . . . if you're a pedestrian, you'd better keep your head up and make sure you're watching for bikes as well as cars. Bikes are kings of the roads. There were a lot of museums and cultural things to take in . 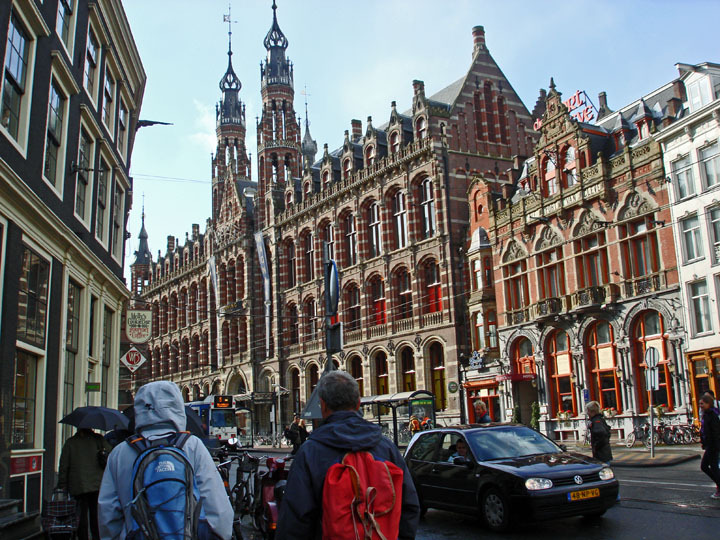 . . . . including the moving Anne Frank House and the Van Gogh Museum. I delighted in being a nerd . 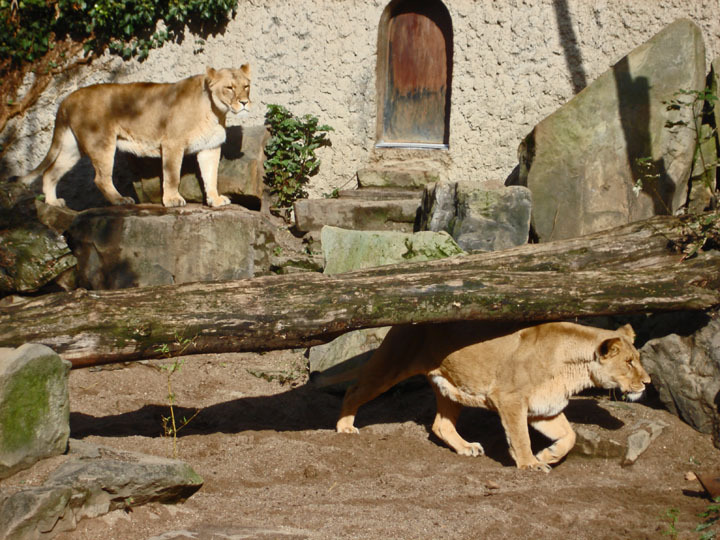 . . . . .
. . . . . but it seemed odd that I would leave Africa and find lions in Amsterdam, here at the zoo. 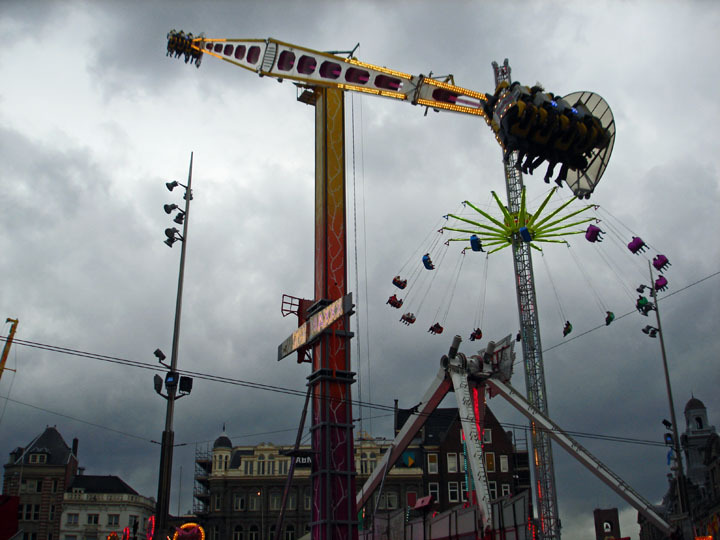 Under ominous skies, the midway came to Dam Square in central Amsterdam. The city is fairly small at it's core and easily walkable. 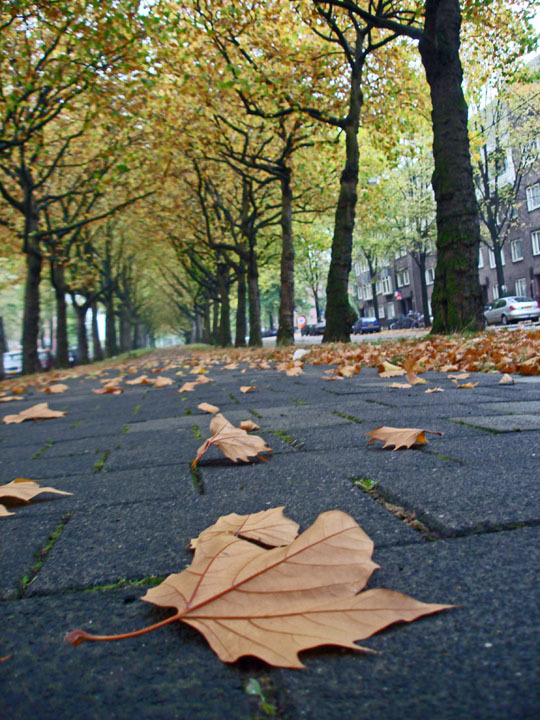 Near Olympic Stadium, this leafy avenue would soon thunder with the feet of tens of thousands in the marathon, half-marathon and 7.5 km races. I ran the Mizuno Half Marathon in 1:53:04, helped a bit by altitude acclimatization in Africa, and it was a thrill to run under the Olympic rings into the stadium to finish the race.